Newport Yachting Center was a wonderful place to live for a few weeks as we staged for our Atlantic crossing. 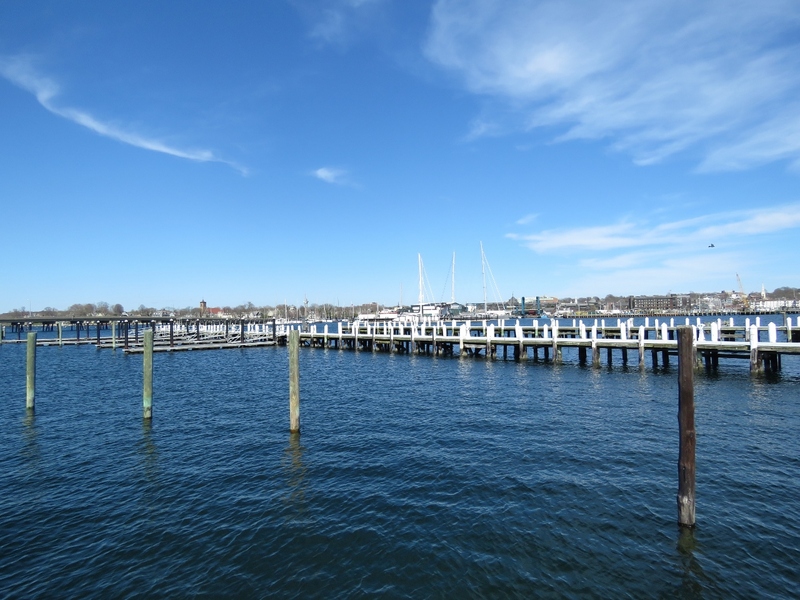 The marina had just put its docks back in the water the week prior to our arrival, but we didn’t realize just how early we were in their season until we’d been there a month and perhaps shared the marina with another boat on only two or three nights. We loved having the place all to ourselves, the marina crew spoiled us, and Newport, with its many excellent restaurants, is an awesome town to visit in the off-season with the summer crowds gone. The view from our berth west to Goat Island. 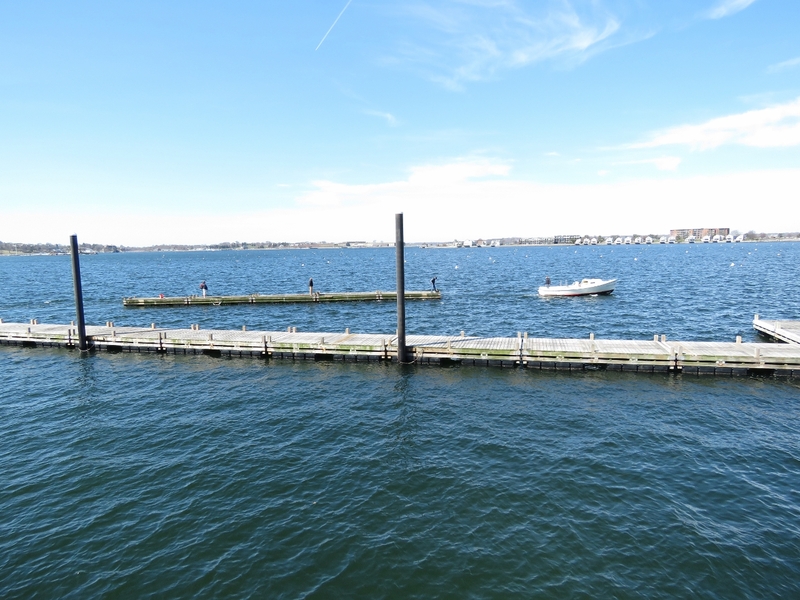 All those little white dots are mooring buoys—in the height of the summer season the harbor will be packed with boats. The satellite imagery for the harbor shows how busy it gets. Right now only one boat is on a mooring in the entire bay. We use a Ubiquiti Bullet with an antenna at the top of the stack for WiFi connectivity. We use another inside to connect with a cell phone via WiFi. And, of course, we have a couple of spares as well. This morning we upgraded to the latest firmware which had the unfortunate side effect of breaking Secure Socket Shell (SSH) support from the router. SSH still works from Windows so this isn’t a huge inconveince but it does disable the health checks from the router in our custom network router software. We could roll back the firmware version on the Bullets but decided to simplify the router-to-Bullet health check to no longer need SSH. More work than originally planned but probably a better solution. This morning we found the breaker for the pilothouse 120V outlets had tripped. We investigated all the electronics plugged into the PH outlets but the breaker would still trip. We eventually unplugged everything and it still tripped so it must be a bad breaker or a problem with the circuit itself. We got out the boat wiring diagram to investigate more deeply and Jennifer noticed there were two more outlets on the circuit up on the boat deck. Stepping outside, the source of our issue was pretty obvious. It looks like water intrusion at the socket is the cause. This is the same socket where, when investigating a water leak in the stack area, we had found a loose wire at the socket. Two problems is too many, so we will replace the socket entirely with a water proof variant and replace the wiring that runs to the socket to ensure that all is new and dry. The parts are ordered from Amazon Prime and, for now, we have an extension cord bringing power up to the PH. 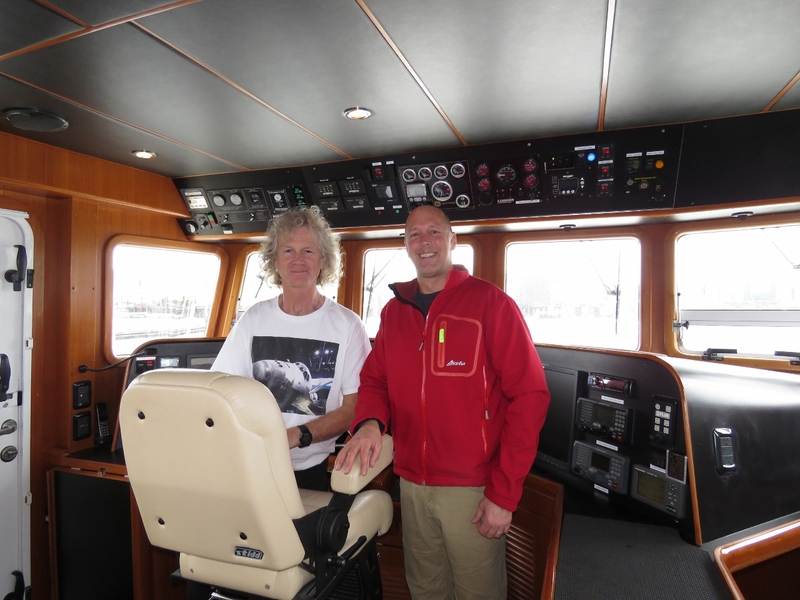 Matt Boliver of nearby Middletown, RI has been following our blog and stopped by to welcome us to Newport. 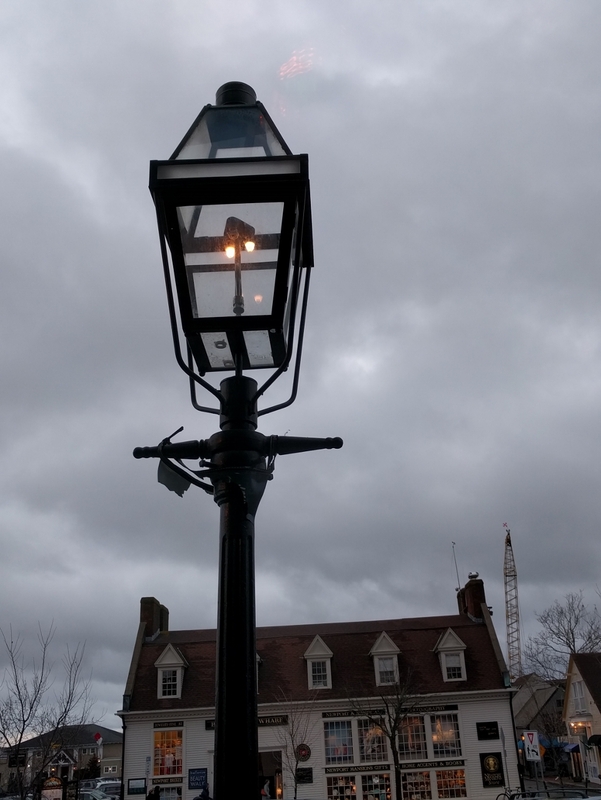 The street lamps in Newport are actually gas-powered with a filament, just like a giant version of the Coleman lamp we used on camping trips. 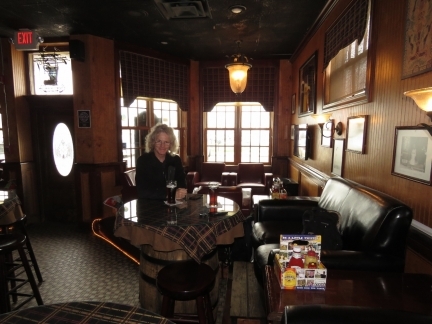 A window seat for dinner at the Irish pub One Pelham East. 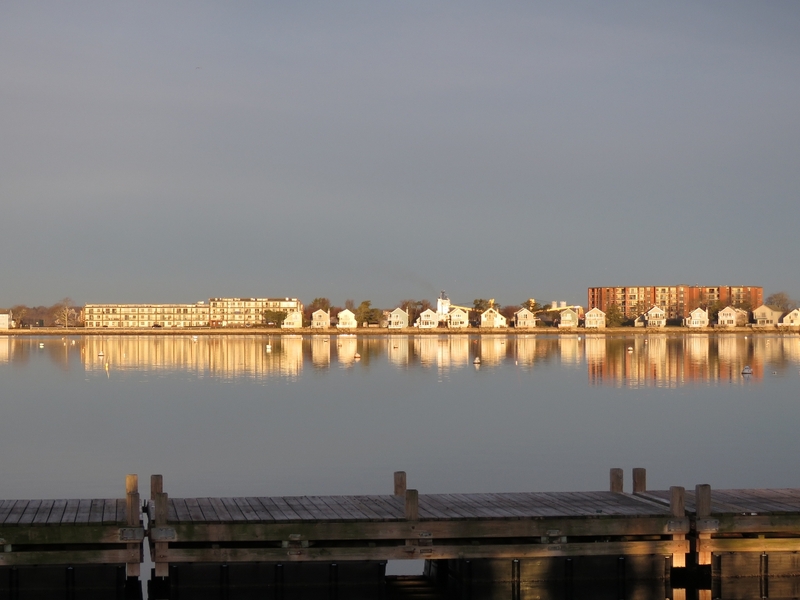 A beautiful calm morning after a couple of days of heavy rain and high winds. 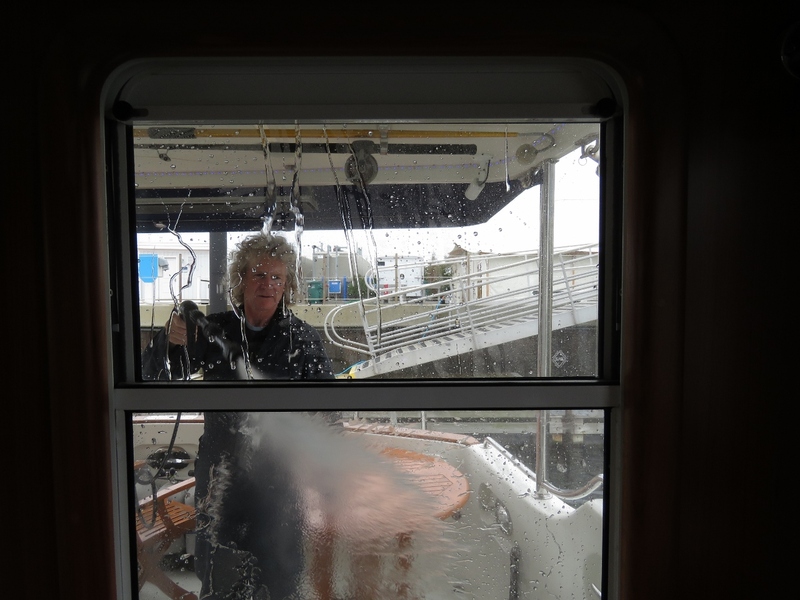 The rain rinsed off all the salt that covered the boat from the run to Newport. This was nice as we can’t wash the boat until we get freshwater on the docks. David Meixell sent us some pictures he took of Dirona over the weekend. 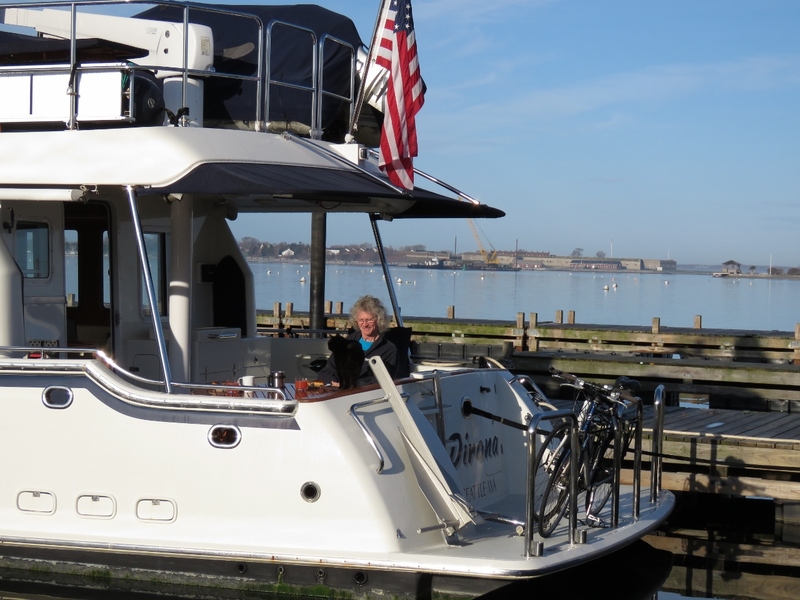 David and his wife Mary were in the area working on their Mason 44 sailboat Zephyr. 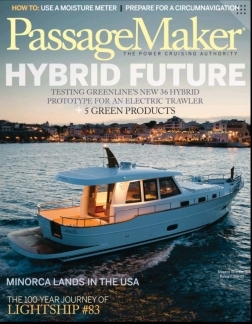 The Mason was the first line of boats built by PAE, the manufacturer of Nordhavn. So Zephyr essentially is a sistership to Dirona. 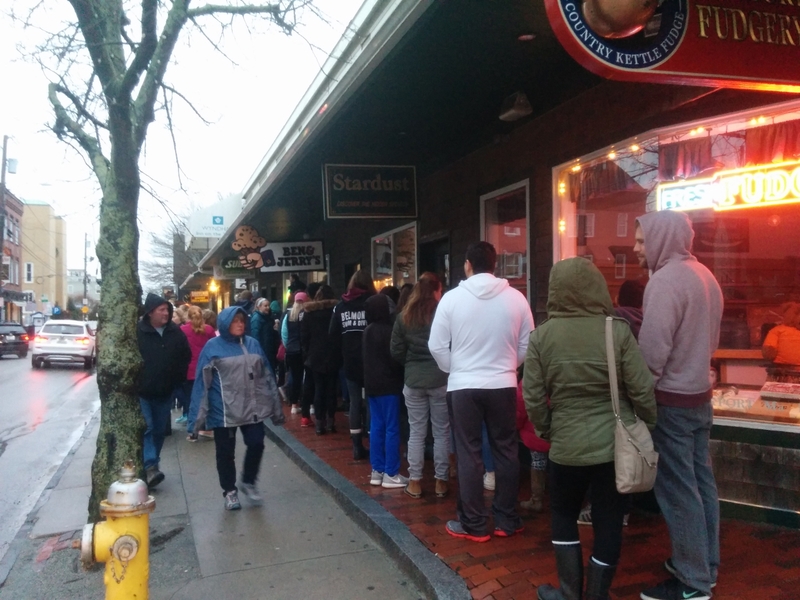 As we walked down Thames Street this evening, we saw literally dozens of people with ice cream cones and the local Ben & Jerry’s was lined up into the steet. It was a rather chilly evening, so we couldn’t understand the ice cream popularity. Apparently they were giving out free cones and it had been lined up like that all day. 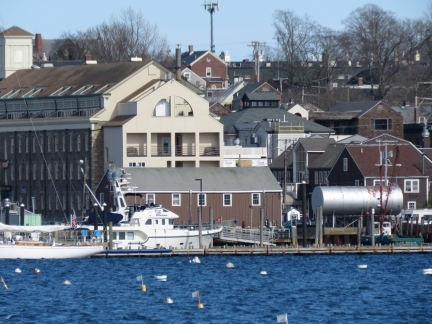 In Southwest Harbor, Maine we’d installed several IP cameras. 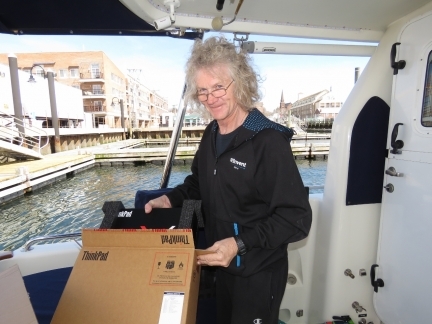 We had an old, non-functioning camera on the lower starboard stack winglet that today James replaced with a new IP camera. So we now have five IP cameras, one forward, one aft, one on each lower stack winglet, and a fifth in the engine room. These cameras mostly are used for security, but also are useful for close-quarters maneuvering. 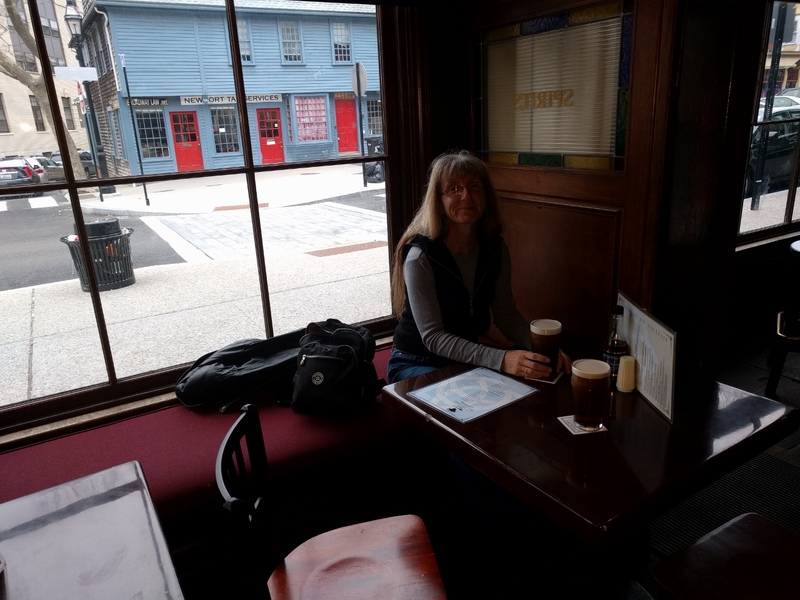 After a long day of boat projects, we had a relaxing evening at a corner window table in the Fastnet Irish Pub with Jennifer’s favourite beer, Kilkenny. We’ll soon be in the “Land of Kilkenny” (Ireland). 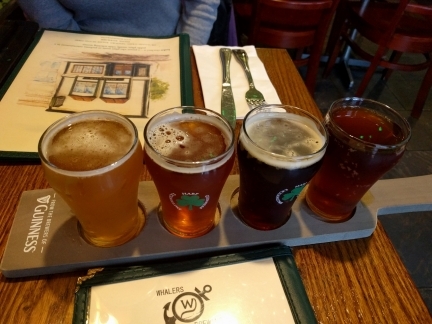 A tasting flight of locally brewed Whalers craft beer at Buskers Irish Pub. 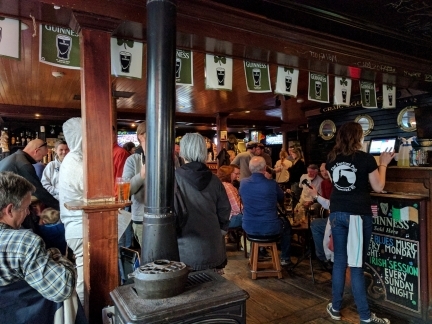 As did the nearby Fastnet Pub, Buskers also had Kilkenny on tap. US Irish pubs don’t usually serve Kilkenny, so it was unusual to find the beer in two pubs so close together. 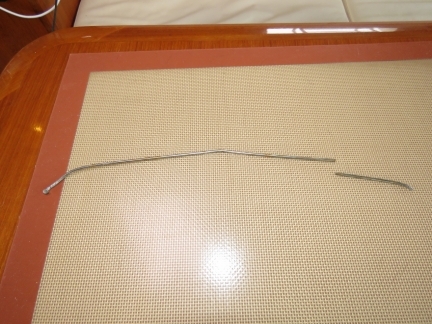 When changing the motherboard in our boat computer a few weeks ago, we noticed very old thermal conductivity compound between the CPU and the active heat sink. 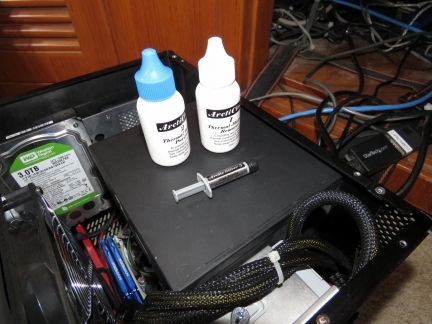 Today we replaced it with some new Arctic Silver 5 Thermal Compound. What a difference that made. Prior to replacing the thermal paste, the CPU at normal load was running a steady-state temperature of 75°C (167°F) and the CPU fan was running between 1700 and 1900 RPM. Running the same workload after application, the fan was down 500 RPM, running at a steady 1200. But even more notable is the CPU temperature is now down to 53°C (127°F). 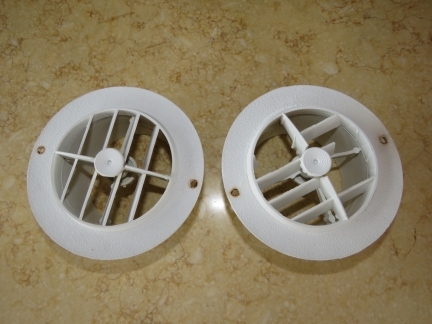 That’s a reduction of 22°C (40°F) with the fan now parked in super-quiet mode. 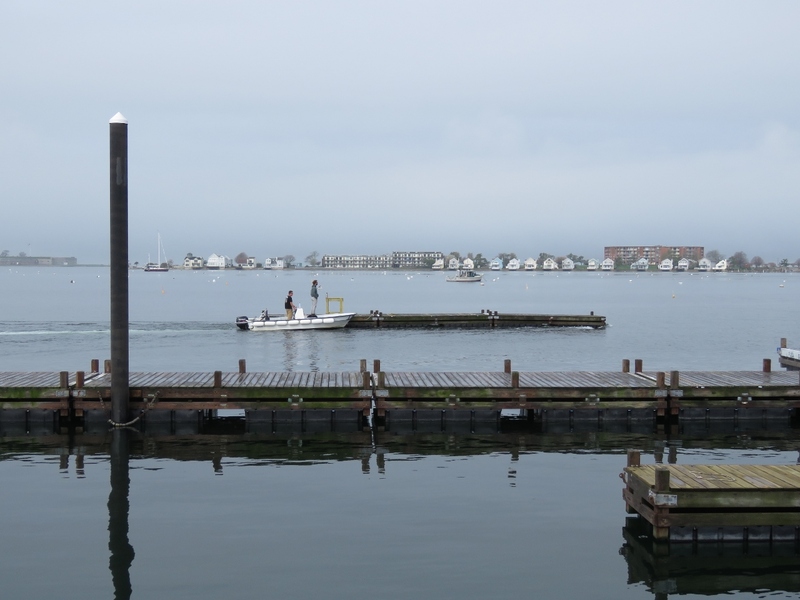 This barge has been moored near Diego’s restaurant the entire time we’ve been here and was just moved this morning. 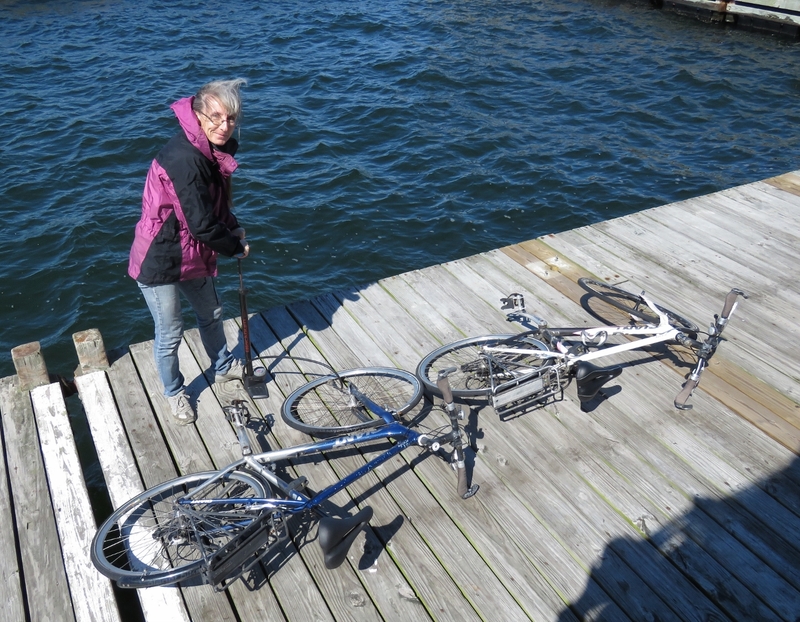 We got the bikes down for the first time since Charleston in January. Partly due to time, but also temperature differences, the air in the tires was very low. 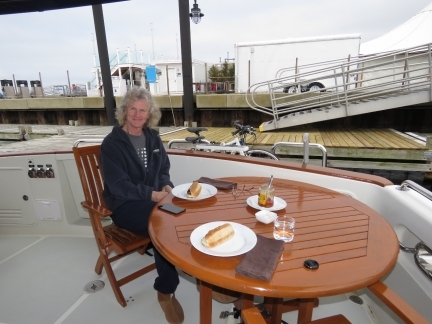 We’re still the only boat at Newport Yachting Center and the crew is spoiling us. They deliver any packages we get right to the boat and even though the marina doesn’t have a waste disposal service, they offered to discard it for us if we just left a sealed container on the dock near the stern. We’re really enjoying our stay here. 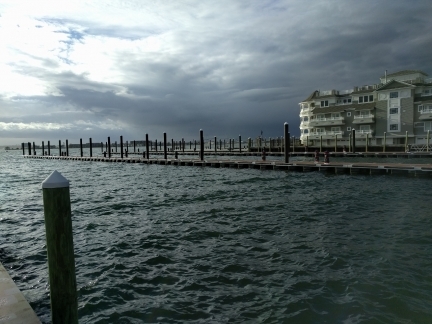 We’ve been seeing steady winds around 25 knots the past couple of days and, judging by the barometer, we’ve got more winds coming when it starts to climb. Newport Marina is huge and completely empty. 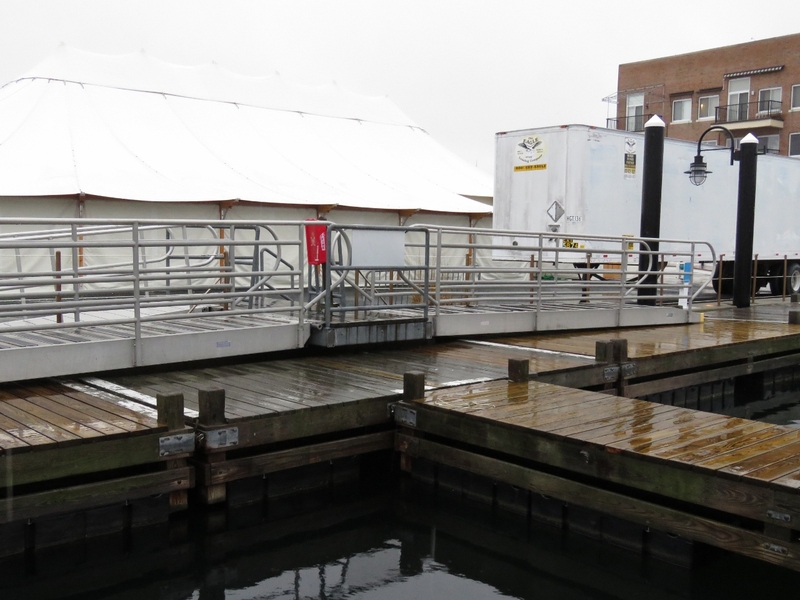 They don’t appear to bring their docks up in the winter, but rather cover the power pedestals. 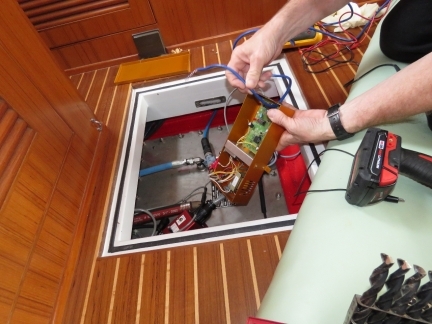 We peeked into the cavernous building housing the International Yacht Restoration School (IYRS). The wonderful smell of wood filled the air, particularly from wood being steamed for pliability. 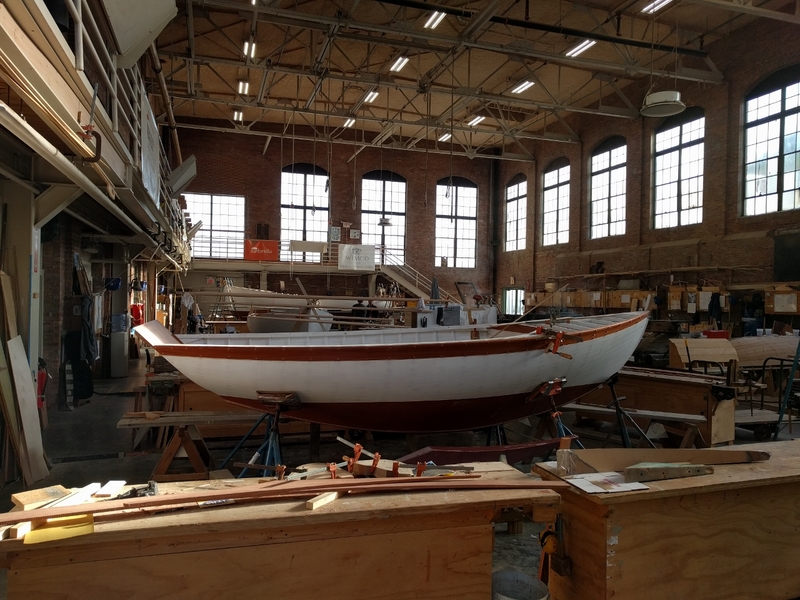 IYRS’ two-year comprehensive “Boatbuilding and Restoration” program combines the craft of wooden boatbuilding with the modern problem solving skills and is regarded as the best in the industry in training the next generation of master craftspeople. Jennifer finishing off an exceptional bone-in steak at the At The Deck restaurant. The owners were sitting nearby and the place was full of locals. We had an excellent evening. 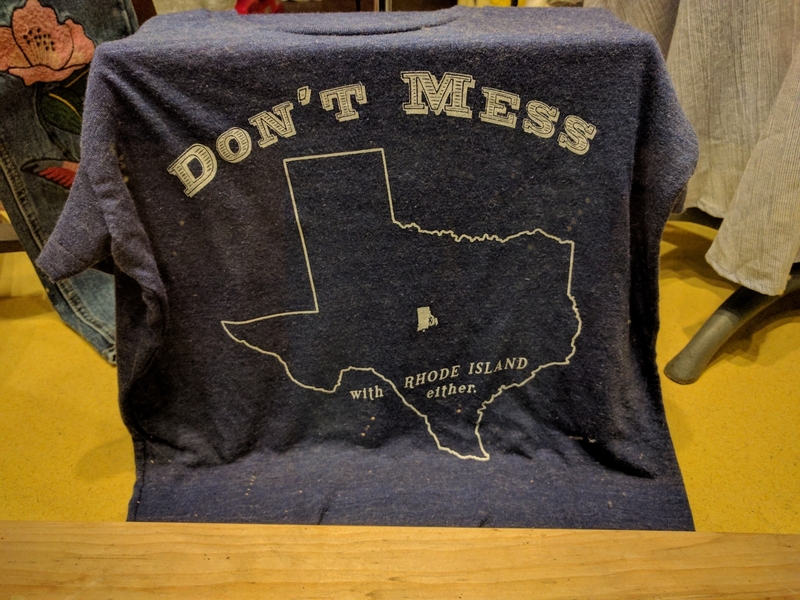 We loved this “Don’t Mess With Rhode Island Either” T-shirt showing tiny Rhode Island embedded inside a huge Texas. “Don’t Mess with Texas” was a slogan the Texas Department of Transportation used to reduce littering on Texas roadways. The phrase has since become an identity statement for Texans and is the motto for the Virginia-class submarine USS Texas. Jennifer returning from a Dunkin’ Donuts run with a bag of Boston Kremes. 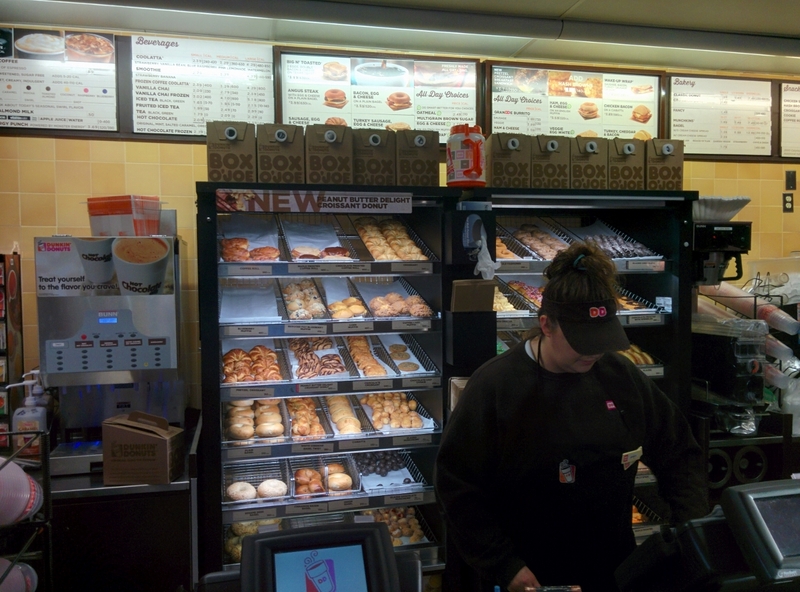 We’ve not been near a Dunkin’ Donuts or any kind of regular donut store since leaving Baltimore. 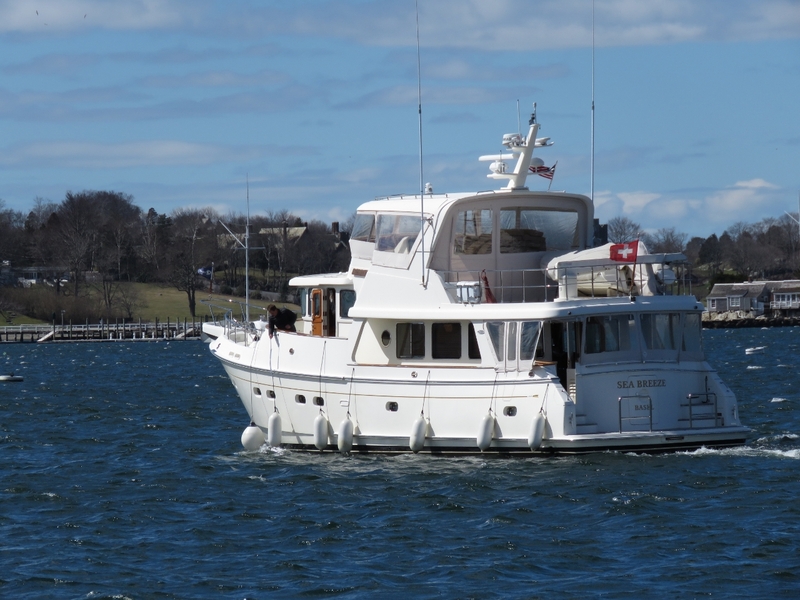 It seems appropriate that the first pleasure craft we’ve seen underway since arriving in Newport is from a cold climate. Selene 60 Sea Breeze is registered in Basel, Switzerland and last year crossed the Atlantic from Norway to Labrador via the Shetland and Faero Islands, Iceland and Greenland. In Florida, 50 degrees and sunny would not fill the patios. 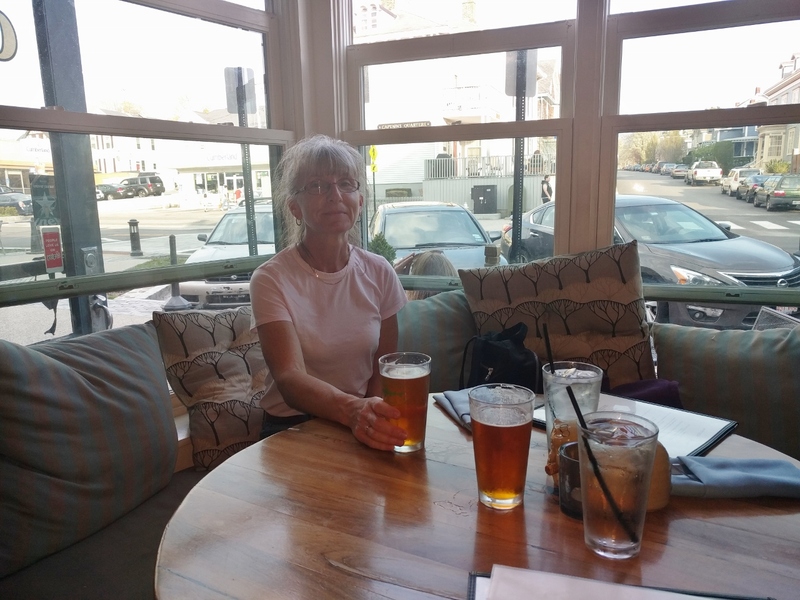 But in Newport all the restaurants have flung open their doors and windows and are packed with patrons enjoying the spring weather. Different cities seems to have different popular restaurant nights. In Australia, Wednesday was always a busy night. 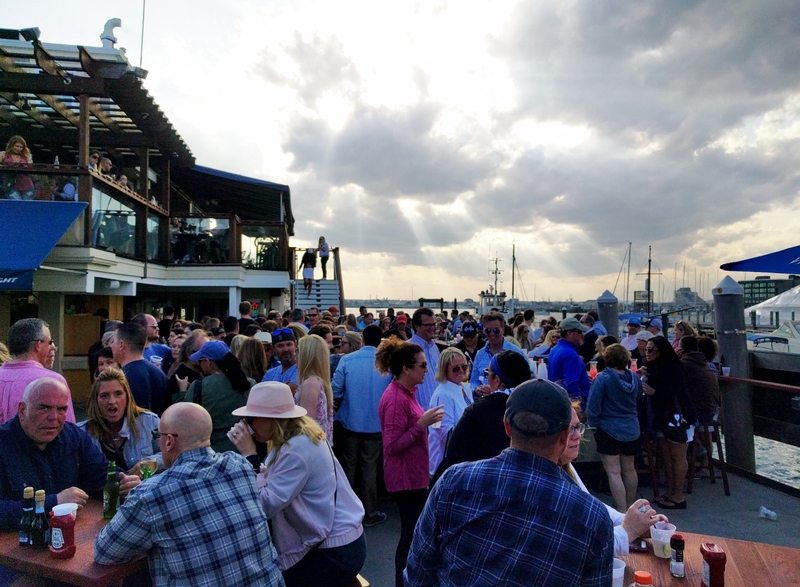 Sunday seems to be a busy night in Newport (although our two test cases both occurred on warm, sunny days). 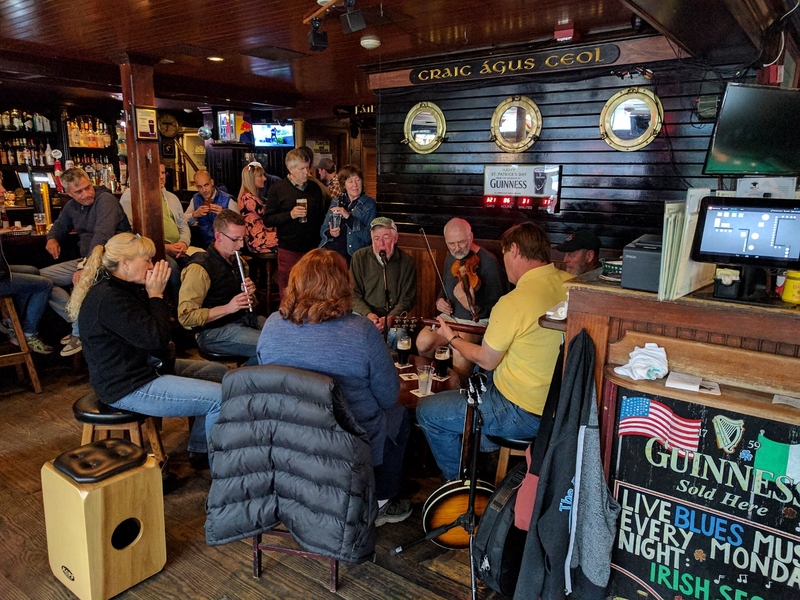 For the Fastnet Pub, the draw might also have been the excellent live Irish music (the musicians are seated slightly right of center). Whatever the reason, the place was packed to standing room only. 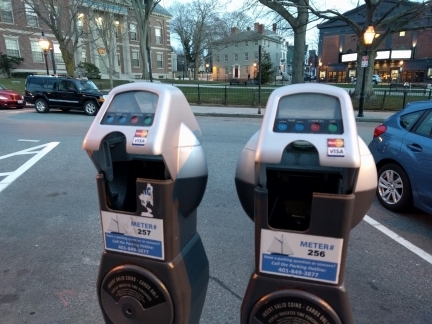 Many east coast locations that are busy in the summer don’t charge for parking in the winter. Some cover the meters, but Newport removes the mechanism entirely. We’re not sure what the donut situation will be in Europe, so we’re taking full advantage of the nearby Dunkin’ Donuts. A beautiful, calm and sunny morning. 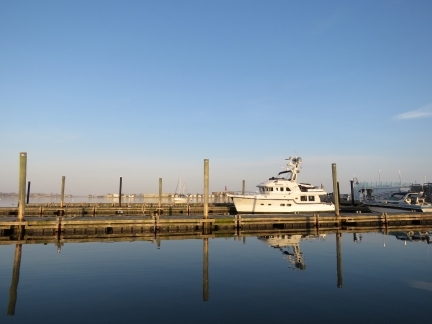 We’re still the only boat in the marina. 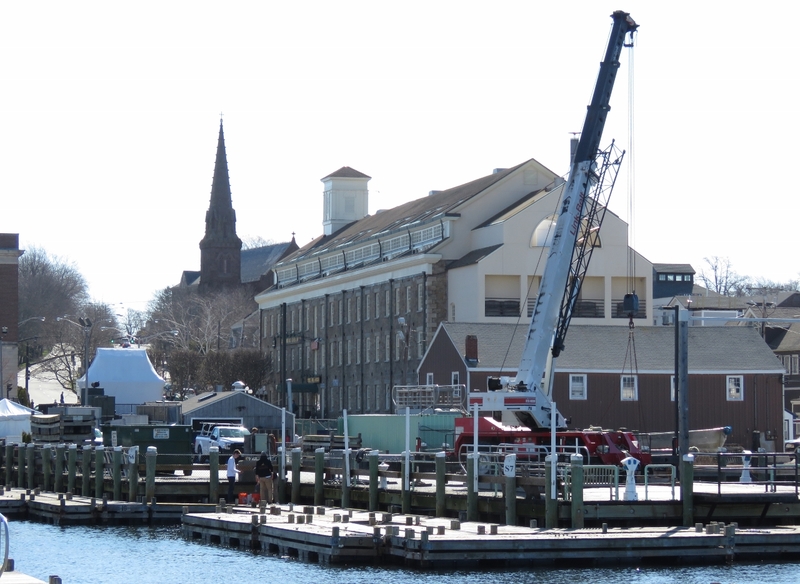 Workers this morning were lowering docks into the water from shore with this big crane. We briefly had another boat in the marina–this boat arrived late and left early. Some marina managers refer to this as “poaching”. 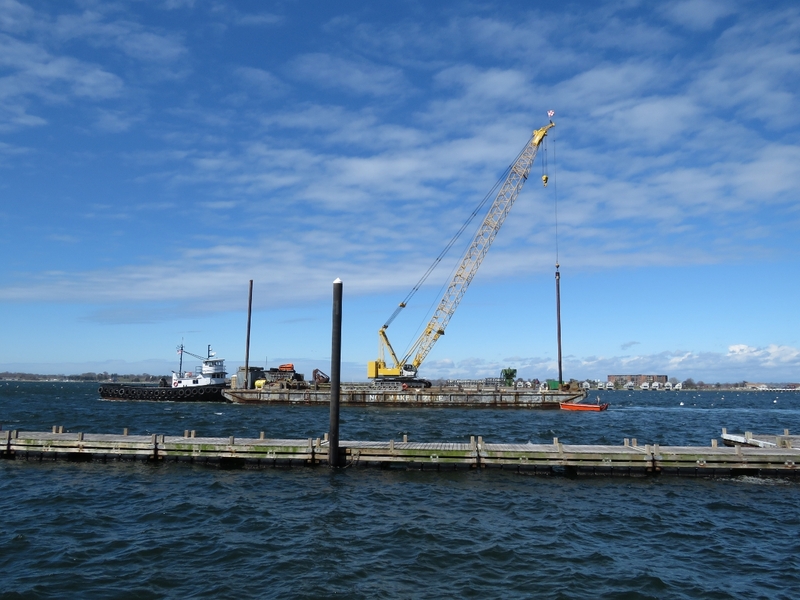 Workers connected up sets of docks that were lowered into the water yesterday and a skiff towed each train to a marina north of us with the workers helping the guide the docks out. 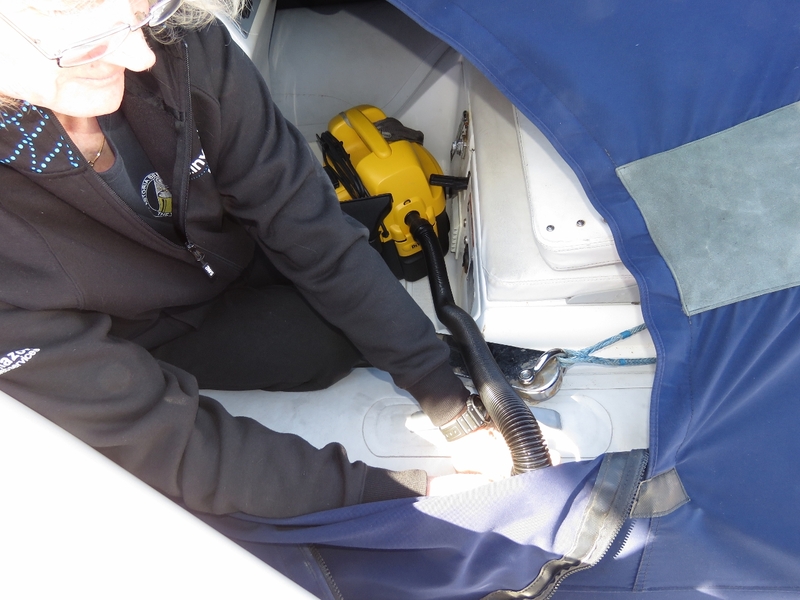 We filled the dinghy and inflatable fenders with air this morning. With the colder weather compared to Florida the air pressure was quite low. 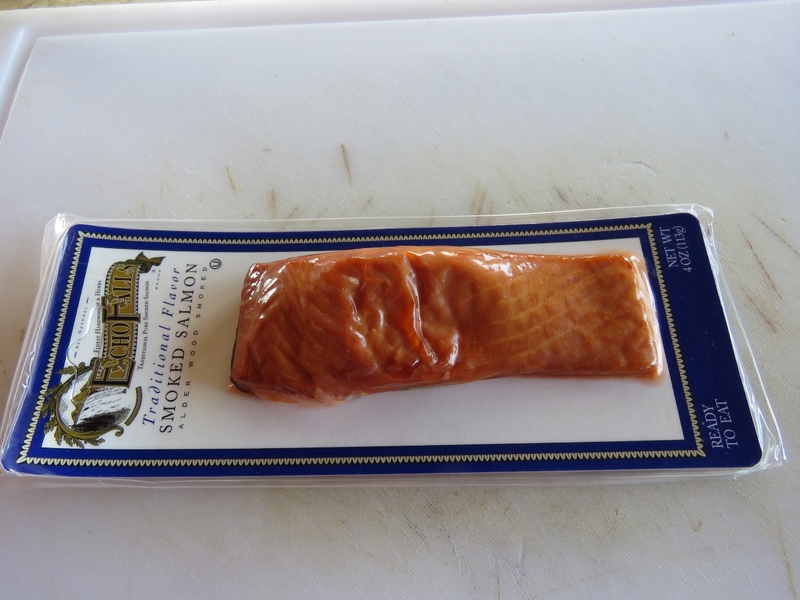 We really like smoked salmon, but haven’t been able to find any since leaving New England last fall. 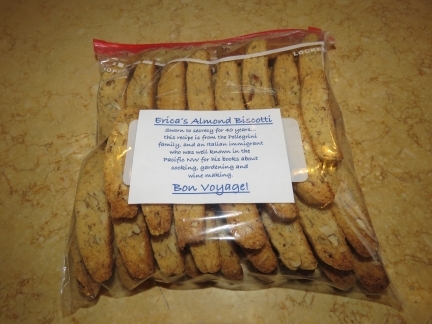 Following the “greedy algorithm”, we bought every package the local grocery store had. James’ laptop is long overdue for replacement. A new Lenovo Thinkpad X1 Carbon arrived today. We’ve been using Thinkpad laptops since we worked at IBM in the early 1990s. IBM subsequently sold the laptop business to Lenovo. Thinkpads continue to be well-though-out designs and they’re very strong. 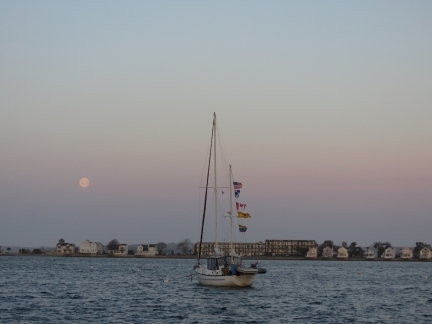 Moonset over the harbor. 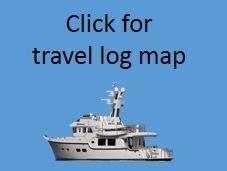 Jean of Arran arrived last night and took a mooring. This is only the second pleasure craft we’ve seen underway since arriving. 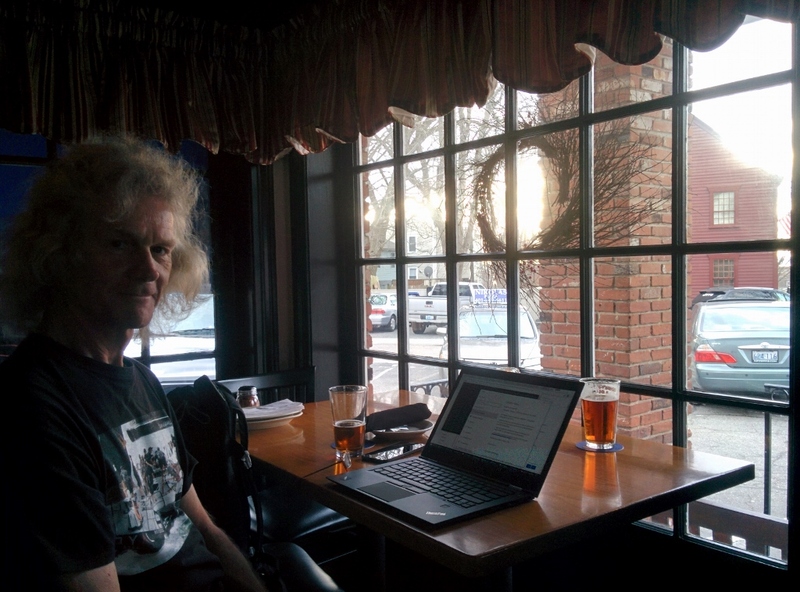 We considered sticking with Windows 7 for James’ new laptop, but decided to try Windows 10. Generally we like it, but the OS is a real data pig on the default settings. The screenshot shows our data consumption stats as part of our custom router software. 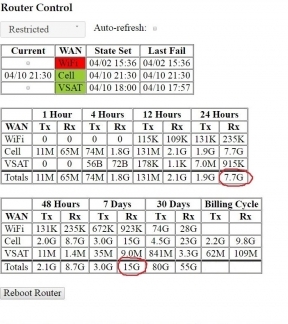 The stats show consumption over each Wide-Area Network device for varying periods, including the start of the billing cycle where applicable. Despite our going to Buskers last night to download software over their WiFi during dinner, we blew through eight gig of cellular data overnight, an amount we’d normally consume in a week. We followed Andre Da Costa’s recommendations on limiting Windows 10 data consumption and that seems to have the bandwidth consumption back under control. James using a vacuum to clear a plugged shower drain and it’s now flowing freely. 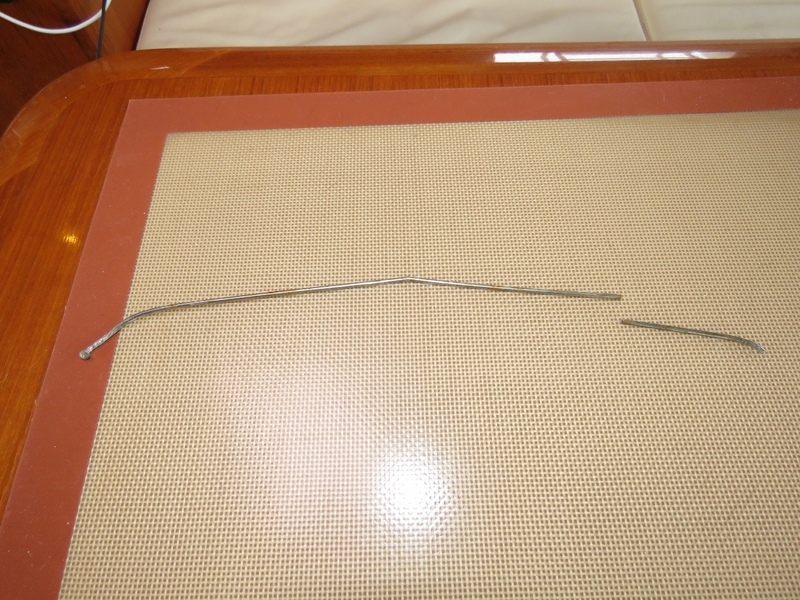 When the boat was new, this used to happen fairly frequently, but hasn’t for the last 4-5 years. We had an excellent dinner with the KVH team at the nearby Clarke Cooke House. 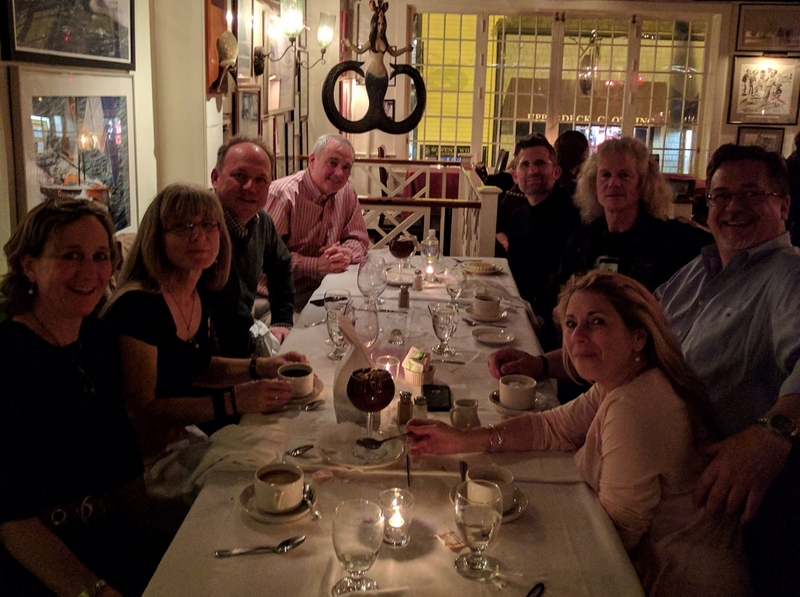 Clockwise from Jennifer’s left is Martin Kits van Heyningen, Brian Arthur, John Croy, Robert Balog, Deborah Balog and Erica Buchanan. 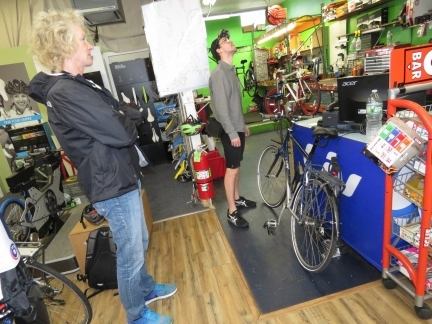 The last time we were in the Newport area, we toured the KVH factory. Another beautiful, sunny morning. A second boat arrived at the marina last night (at right of photo), bringing the total to three transient boats including Dirona and Jean of Arran to our left on a mooring. Both left shortly after the photo was taken, so we’re alone again. Over the last few months, we have seen several instances of the nav computer locking up. The issues that have been understood have been hardware-related and since fixed, but there’s no hiding from the fact that any Windows system running mission-critical software might rarely lock up. Our nav computer is redundant and all navigation data is available on the Furuno MFD black-box. But many of the control systems on Dirona are hosted only on the nav computer. In spares we have enough parts to fully replace the nav computer, so there should be no outage that we can’t correct. However, load-shedding, generator auto-start and sending alerts and warning are all driven by the nav computer, so we really don’t want it down. We don’t expect lock-up or failure to be frequent, but James has configured the Raspberry Pi to monitor the nav computer. If for any reason the computer goes down for more than 15 minutes (allowing time to patch and other administrative actions) the Pi will send an off signal to the computer power-supply to force power-down and then power it back up. 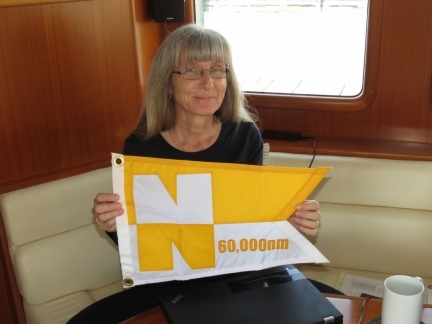 We crossed 60,000 miles on Dirona during the run to Newport and just got our new Nordhavn distance pennant. We had an exceptional pizza dinner at Nikolas Pizza, the best pizza we can remember for a long time. We’ve also brought James’ new laptop along to download software using their WiFi as the marina WiFi won’t likely be operational until mid-May. As we travelled the world, we frequently saw cruisers bring their systems into town for connectivity, but we rarely did this as we usually had good connectivity on-board via cellular or satellite. When installing new computers, the amount of data that’s moved is truly prodigious, so the comparison is not completely fair. But it’s funny that, having rounded the world, it’s in the US that we’re leaving the boat to get connectivity. A dramatic sunset looking down Memorial Blvd toward the harbor. 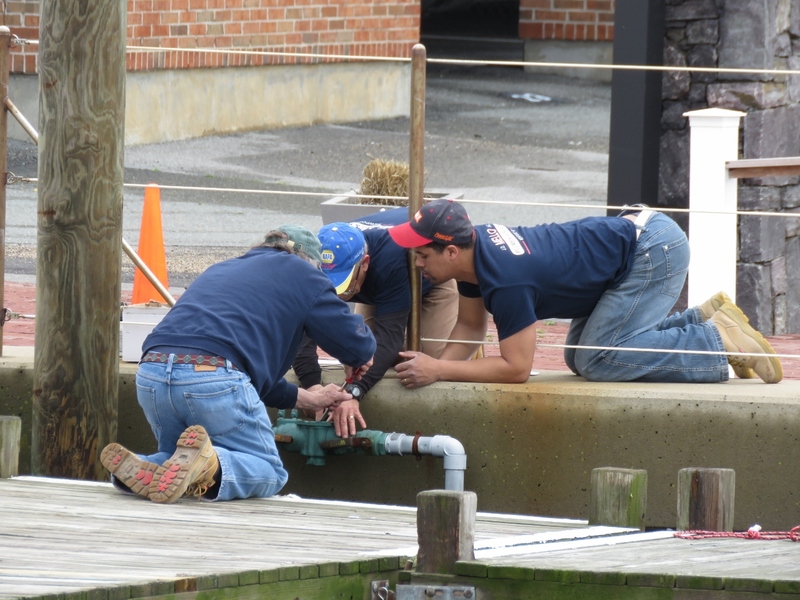 The marina crew were out running water pipes to the dock today. 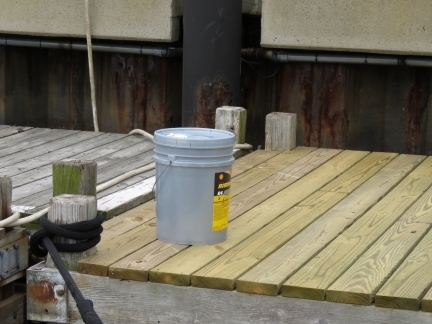 We’re still a couple of weeks away from getting water on the dock, but it’s getting closer. 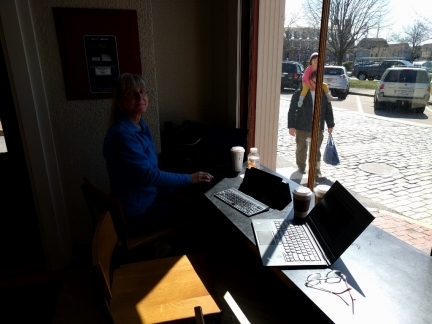 Jennifer’s laptop was newer than James’ old one, but it had taken a tumble a couple of years ago. Both hard drives had since failed, and the case is held together with packing tape. 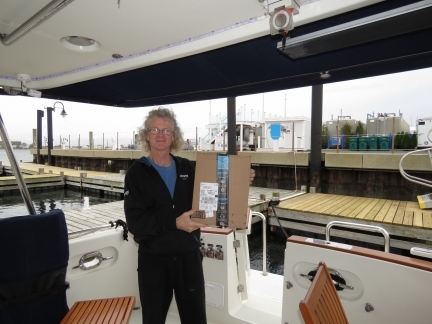 James’ new laptop (Lenovo Thinkpad X1 Carbon) laptop was such as success that we ordered another one for Jennifer. It arrived today and we stopped in at local Starbucks to download software to the new laptop and patch all our devices over lunch. 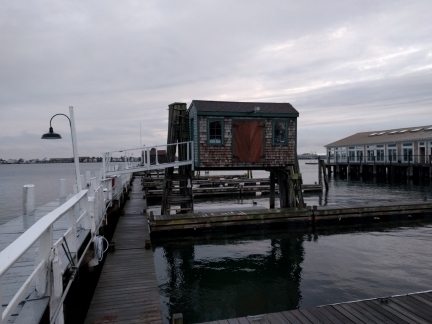 Something looked a little odd as we neared walked back to the marina and we realized this pavilion has doors, but no walls. The structure used for large corporate events and weddings is fully disassembled during the winter and we’ve been watching it come back to life over the past couple of weeks. 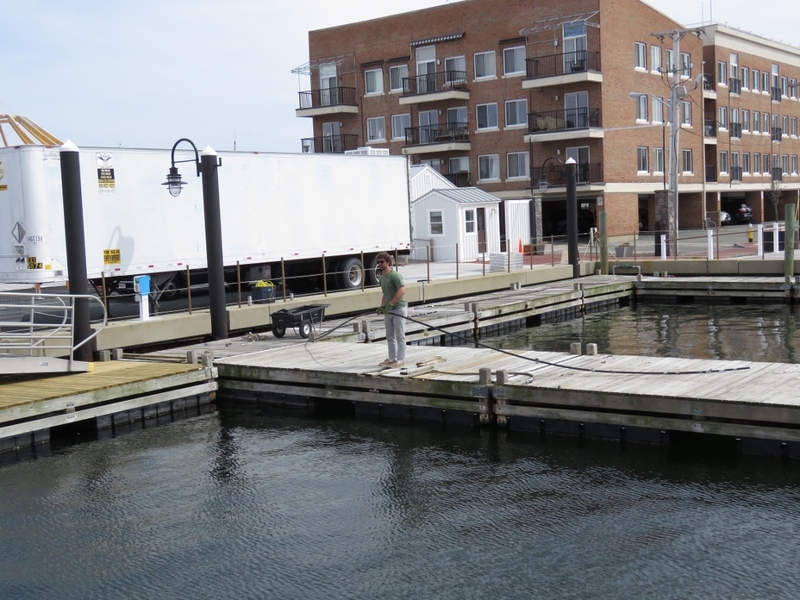 We weren’t expecting to get water on the docks until at least mid-April and likely later, but have been conserving on the the off-chance that we did get water sooner. 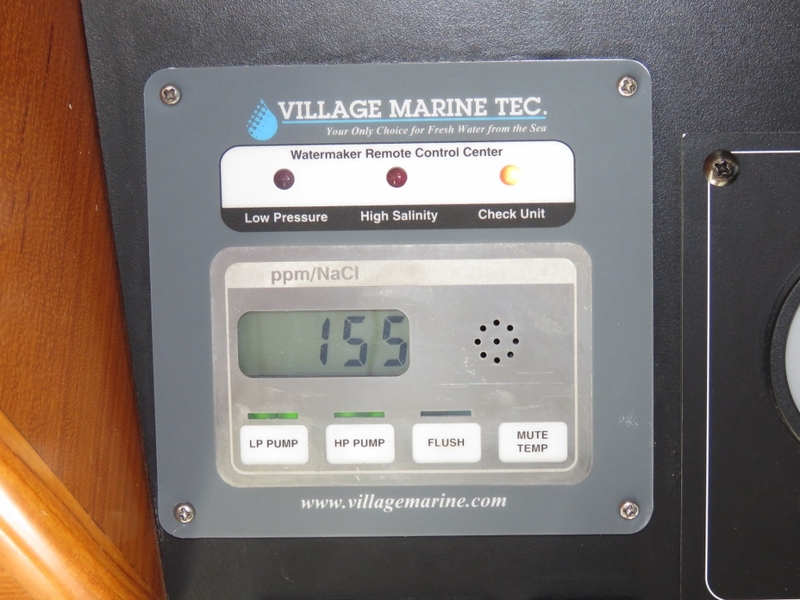 After two weeks we’re only down 200 gallons from the 415 we arrived with, and could easily go another two weeks. 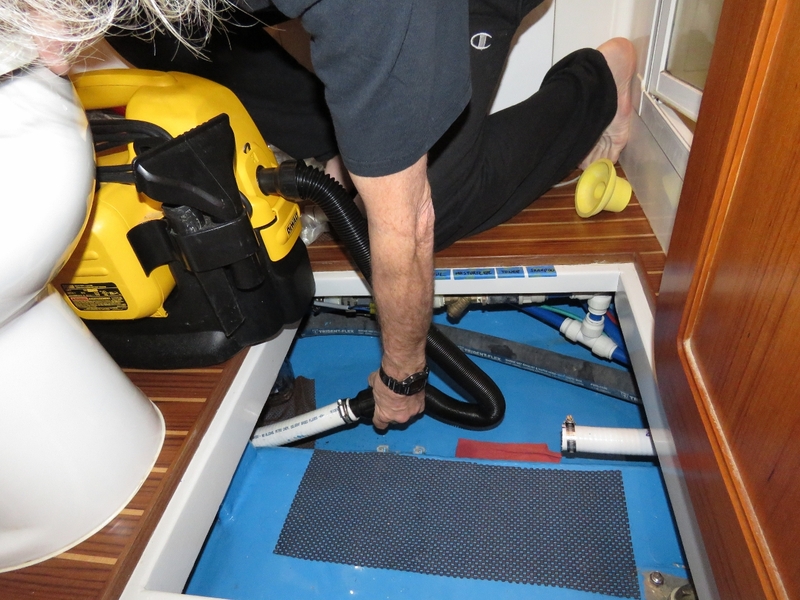 Our style of operation, however, is typically to not go much below 200 gallons and to try very hard not to go below 100 gallons. Our logic is that if something goes wrong and we can’t make water, we don’t want to be without reserves. Today we brought the system back up to 415 gallons using the water maker. The morning was sunny, warm and calm enough to have breakfast outside. 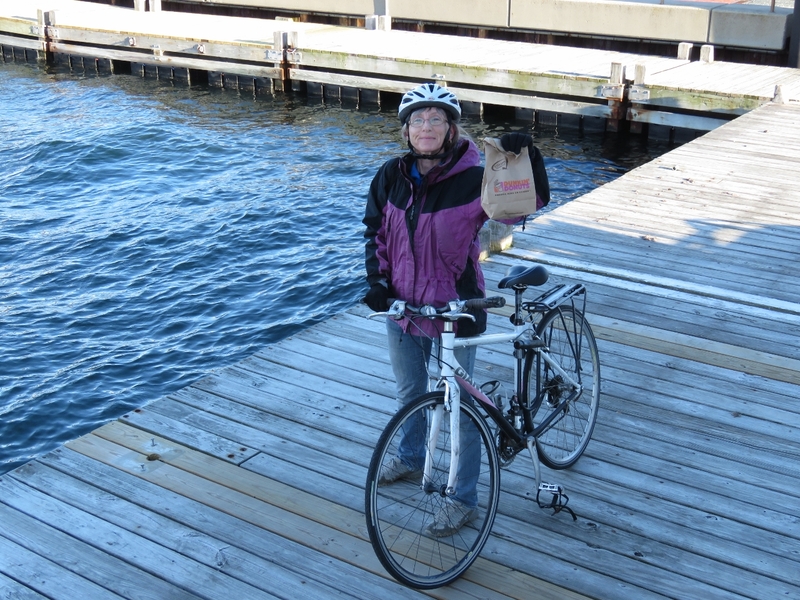 We decided to take advantage of the excellent weather and go out for a bike ride along the seashore via Bellevue Avenue to Fort Adams. The marina crew had notified us that they’d have the shore power disconnected for a little while today. Right on schedule we got an email alert saying that we’d lost shore-power and the N2kView display showed an orange light for lost shorepower and another for excessive drain on the house battery. When the power came back, we got another email from Dirona‘s control systems indicating how long it had been down for. 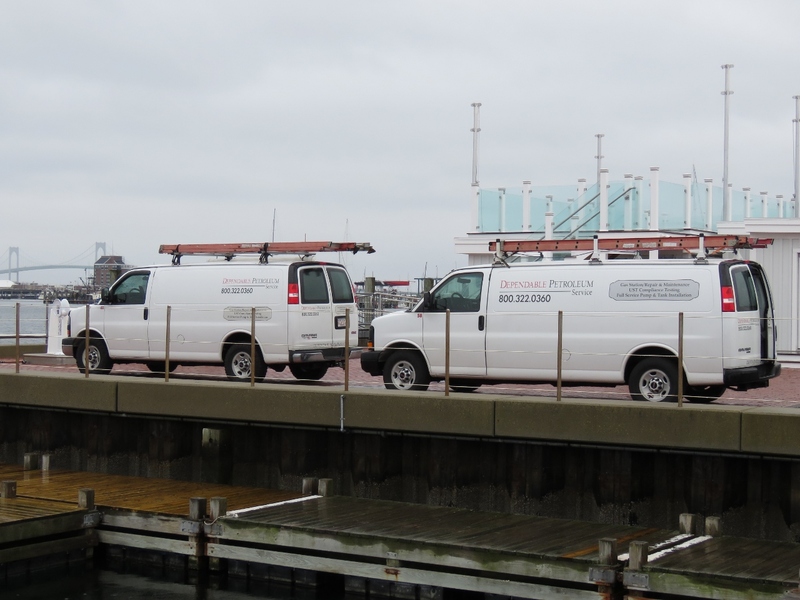 Our turbo coolant bleed pipe (inset) started to leak for the second time (we fixed a leak while in Nova Scotia last fall). There is slight crevice corrosion at the fitting so it’s time to replace it. The replacement is a bit expensive at $45, but it’s easier to use the standard Deere part. We found out, however, that none are in stock and it’s special order. We don’t want a coolant leak before heading out on the Atlantic crossing, so we needed to do something. 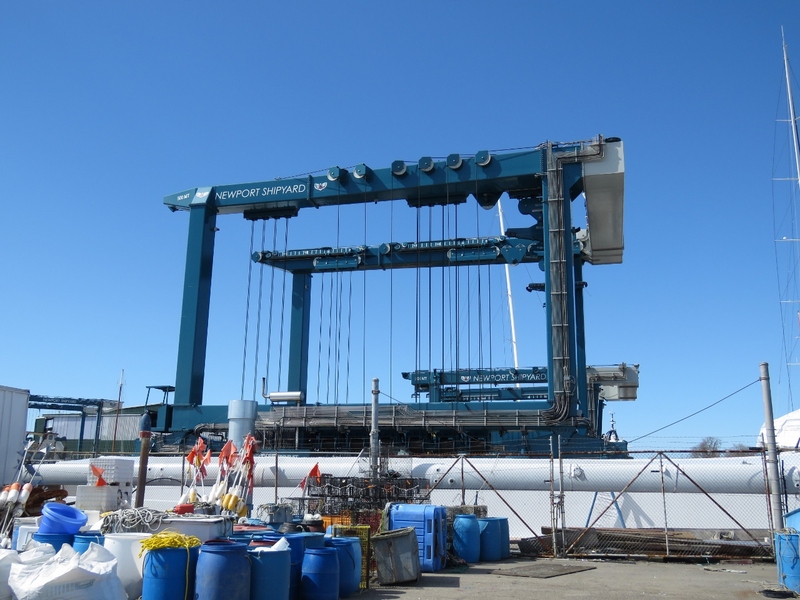 We have stainless steel braid aeroquip tubing and field-installable fittings to be able to repair any faults in our Steelhead ES1100 crane. So we made a replacement for the turbo coolant bleed pipe that actually looks pretty good. We had to get the length just right so that the height monotonically increases between the turbo and the coolant header tank, without room for dips or places to trap air. The hose is quite rigid and doesn’t move or vibrate at all. The hose and fittings are certified for 4,000 PSI and 400F so should be fine in this application with 20 PSI with an engine alarm temp of 231F. Bratwurst sausages in the cockpit for lunch. 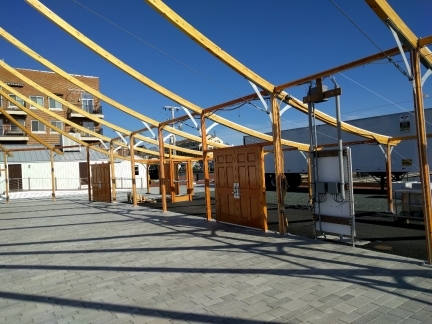 With our outdoor heater on, we can be comfortable outside in as low as 50°F so long as there is little wind. 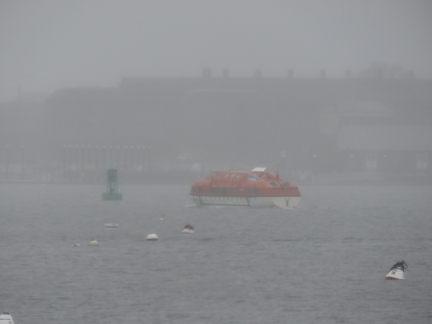 We noticed a lifeboat passing back and forth across the bay this morning. 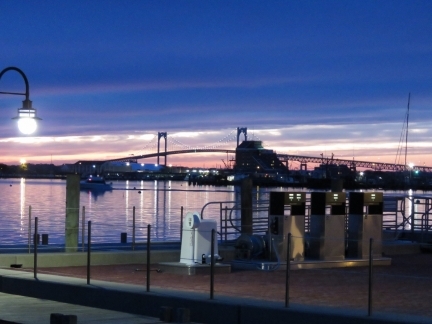 It was ferrying passengers from Amadea, the first cruise ship of the season for Newport. The next one, Victory 1, won’t be here until May 19th. Amadea didn’t get a very nice day for visiting. 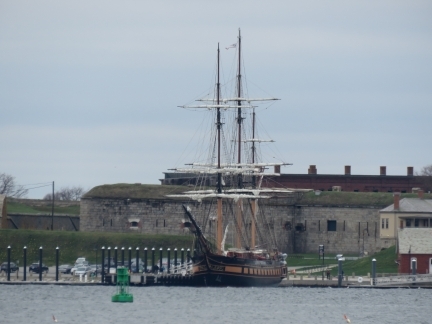 The education-at-sea vessel Oliver Hazard Perry returned to her home port at Fort Adams today after a five-night run from Bermuda. 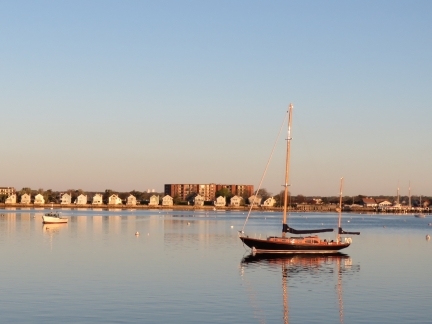 The ship is the first ocean-going full-rigged ship built in the U.S. in over 100 years. When we turn on the house propane to use the stove or the barbecue, the “Gas” indicator light on our N2kView ribbon turns to blue to alert us that the propane is on. After 60 minutes, the light turns to yellow to warn us the propane may have been left on. 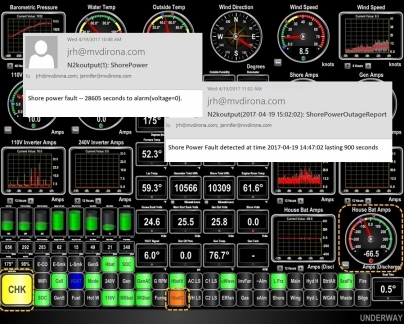 After 90 minutes Dirona‘s control systems turn it red, light the “Chk” indicator red, and sends us both email. 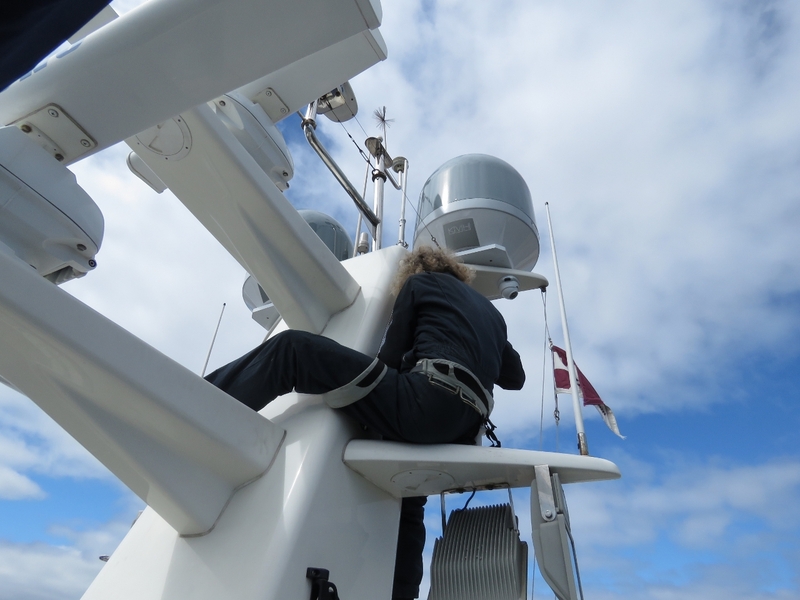 Jennifer was cooking long enough today, preparing meals for the passage, that we hit the 90-minute threshold. 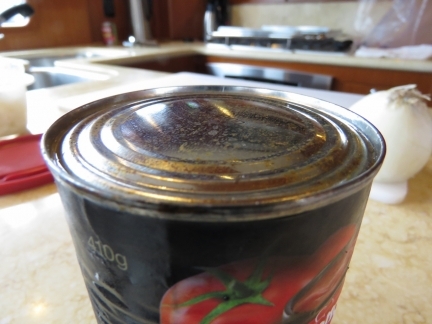 Canned food can last safely for years and we’ve never had can go bad before. But four cans of tomato puree from Australia all were slightly bulging and the first one we opened spurted liquid. We discarded them all. 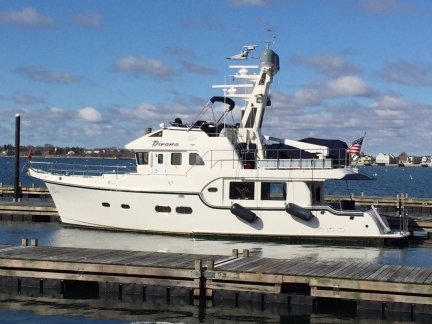 Hound of Vinalhaven, Maine arrived into Newport Yachting Center today with a ‘Q’ flag flying. Like Oliver Hazard Perry, they had just completed an offshore run from Bermuda. 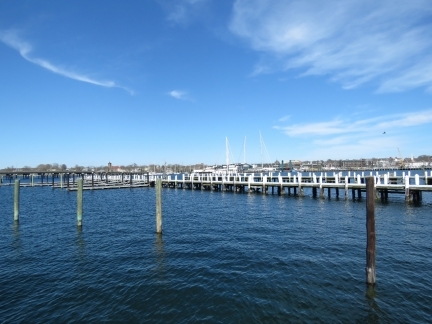 The guest houses at Bannister’s Wharf must be very popular in the summer right on the water. Things are still pretty quiet now. 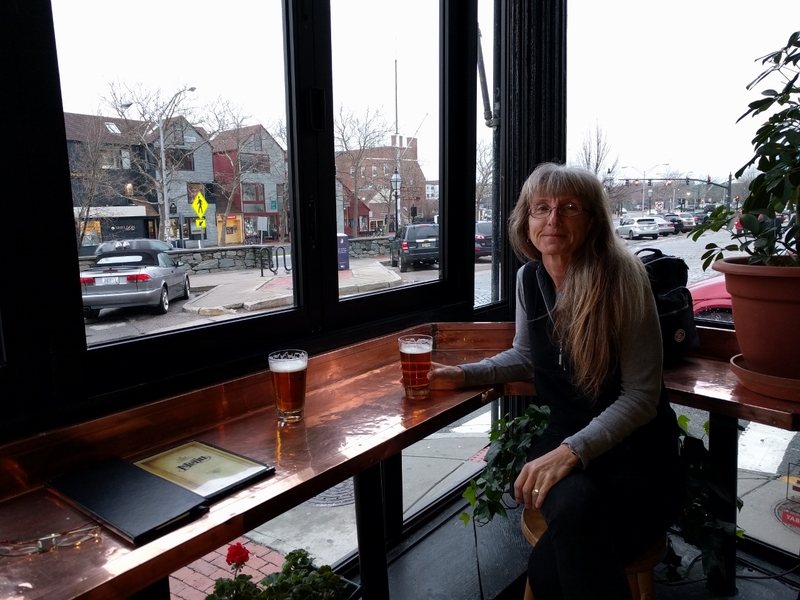 We arrived just early enough at Fluke Wine Bar and Kitchen to snag a window seat overlooking the harbor. 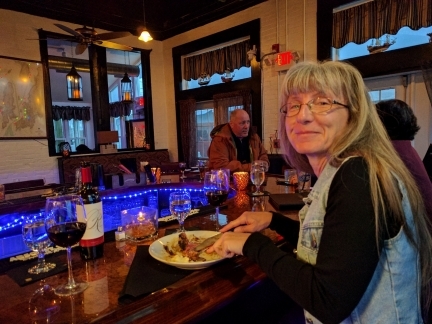 Great food, good wine and good service. By the time we left, the wait time for a table was over two hours. 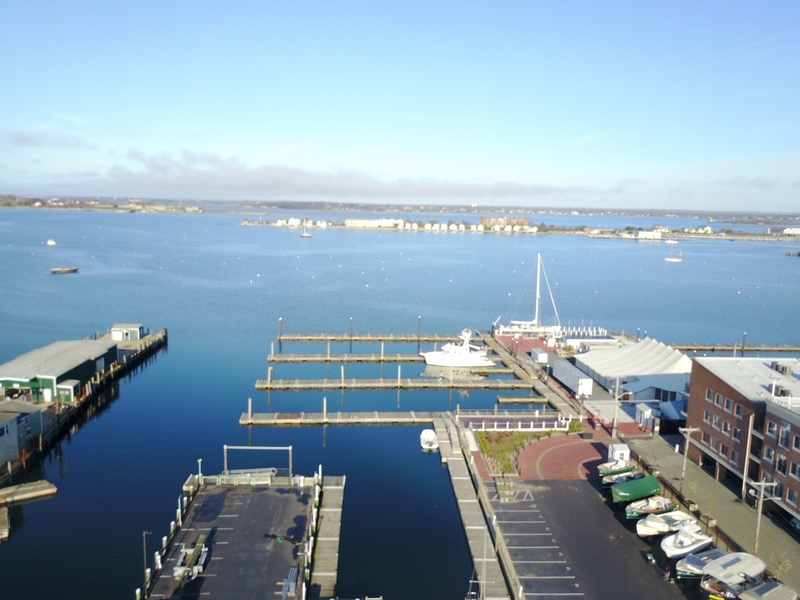 While we were out flying the drone, James glanced over at Newport Shipyard and immediately recognized the hull of Comanche. So we walked over later for a closer look. 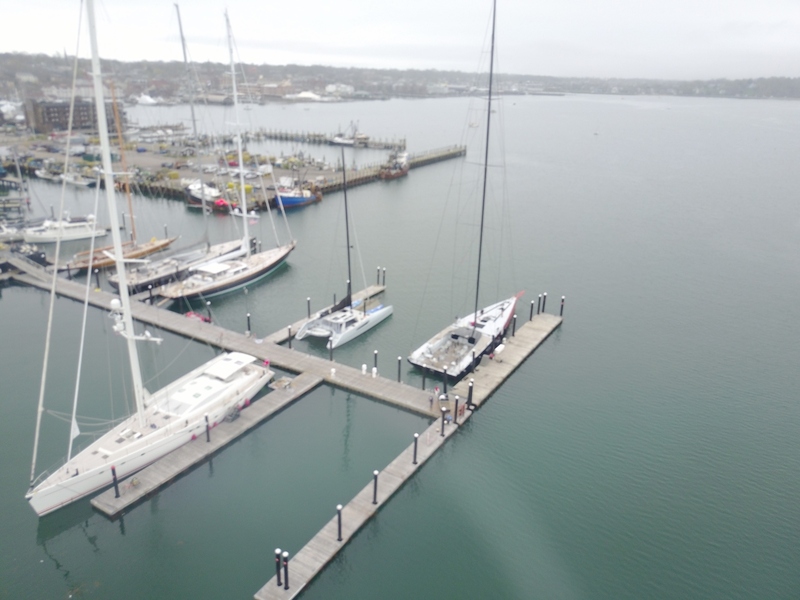 The last time we saw Comanche was on December 26th, 2015 as the field departed Sydney Harbor in the 71st running of the classic 630-mile Sydney-Hobart ocean race. Comanche took line honors with a time of two days, eight hours, 58 minutes and 30 seconds, but didn’t compete in the 2016 running. The yacht has since set a new record in the 635-mile Newport Bermuda race of 34 hours, 52 minutes and 53 seconds, breaking the earlier record by more than 4.5 hours. And it beat the record for a transatlantic crossing by over 24 hours, travelling 2,880 miles in just 5 days, 14 hours, and 21 minutes at an average speed of 21.44 knots. 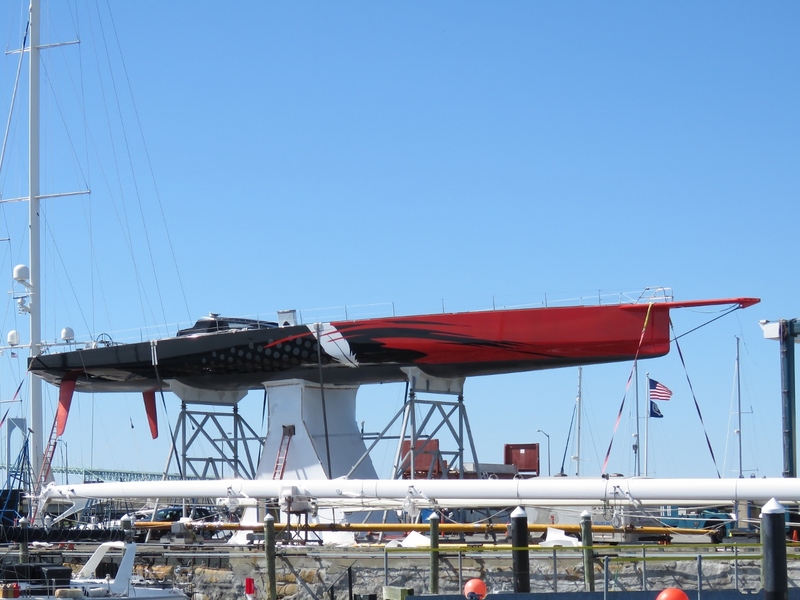 In 2015, Comanche also set the monohull 24-hour speed record by travelling 618.01 nautical miles at an averaging speed of 25.75 knots in 24 hours. We sure could use that speed on our upcoming crossing. We sure could use that speed on our upcoming crossing. 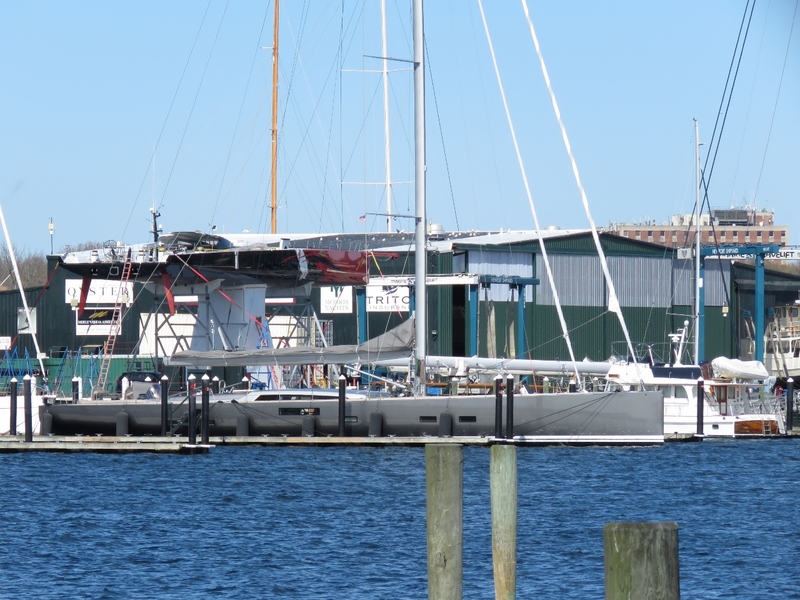 The 500 MT beast of a Travelift at Newport Shipyard. 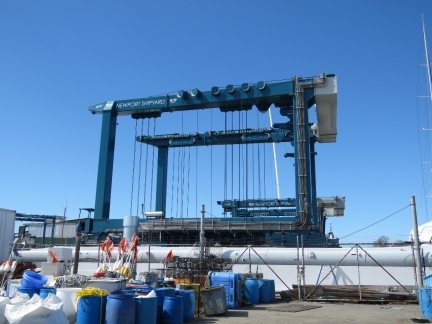 They have three others: a 70MT, 100MT, and a 200MT. Even their smallest could easily handle 55-ton Dirona. The 200MT is a new addition. When we were here late last year, they “only” had three. 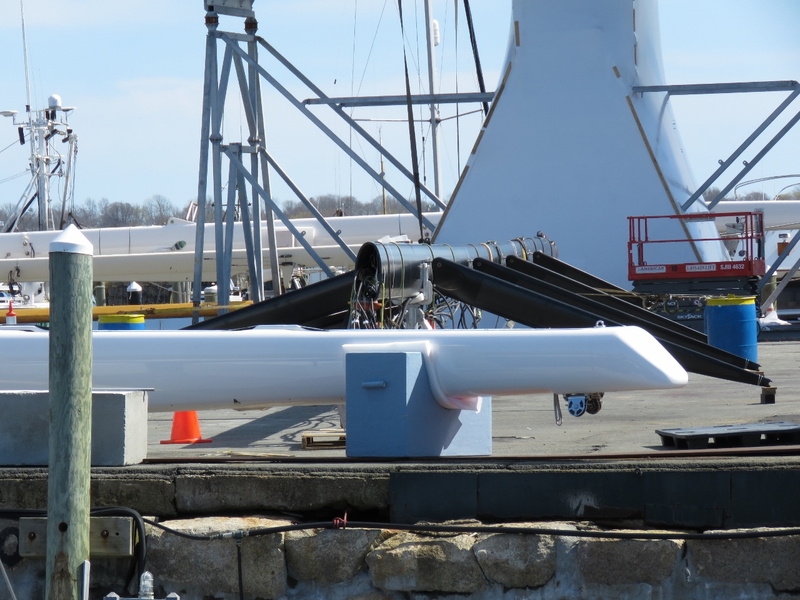 Comanche’s 150ft mast in the yard next to the boat. The mast height was limited to allow passage under the Sydney Harbour bridge. 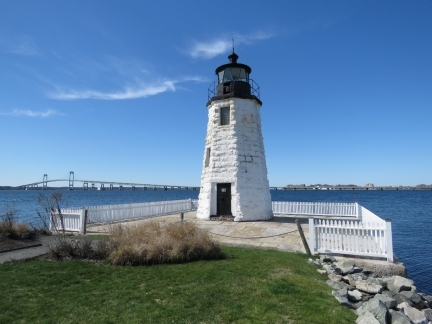 The first Newport Harbor Light on Goat Island was completed in 1823 and was the first light to guide mariners into Newport Harbor. This light didn’t adequately warn mariners of the shoals off the island’s northern tip and in 1842 a new light was completed that stood off the end of the island on a dike. This light has been an active aid to navigation ever since. 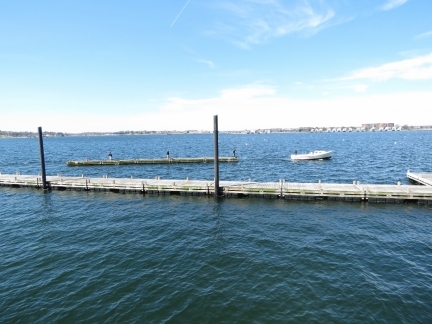 The Goat Island Marina is popular in the summer, but the docks aren’t even in the water yet. 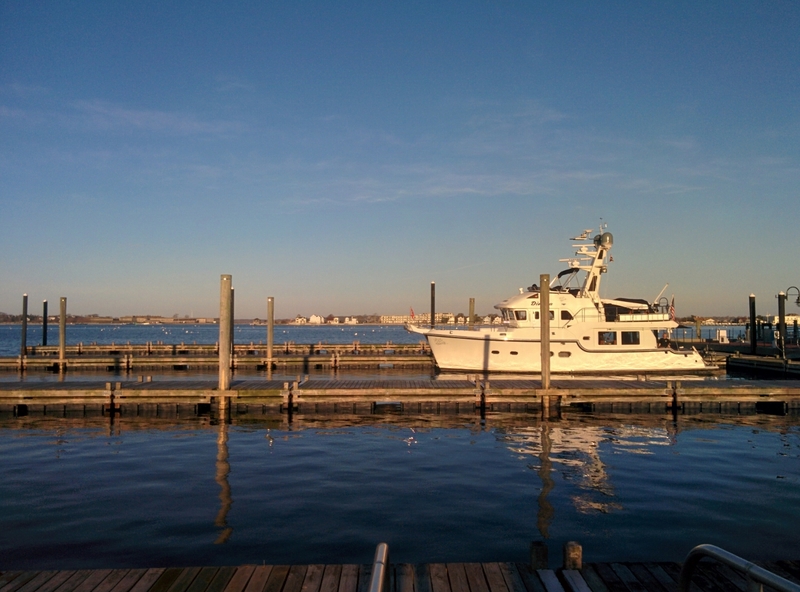 The boating season here certainly is short. The Baltic 115 Nikata was built for racing, but also has luxury accommodations. 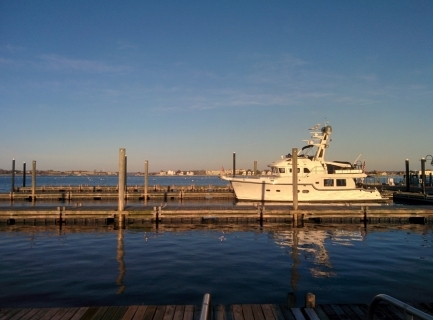 A view across the bay from Goat Island to Dirona at Newport Yachting Center. The Goat Island Marina Cafe and Pub won’t be open for a while. At least not until they get the marina docks back in the water and out of the parking lot. The two Northeast Marine pilot boats at their berth on Goat Island. 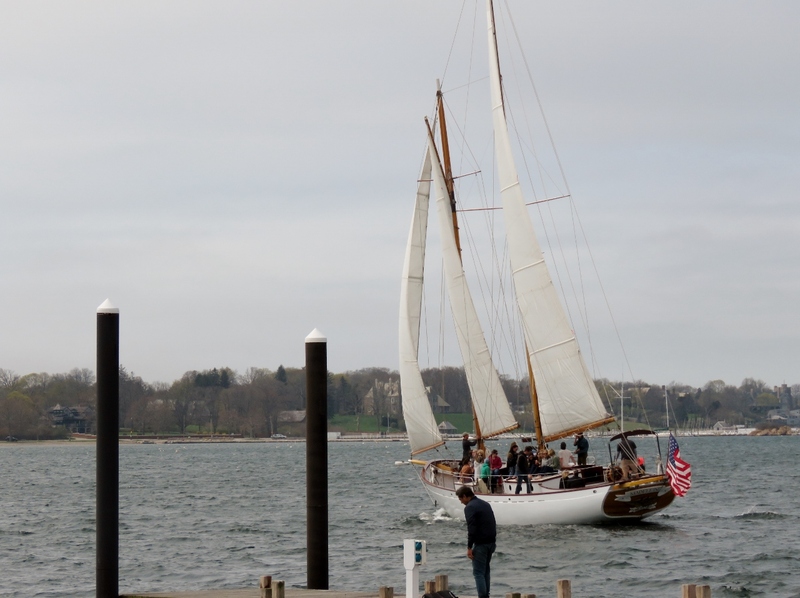 We saw one of them heading out as we arrived into Newport a month ago. The metal portion of the retaining wall has rusted away and the ground behind is eroding into the sea. 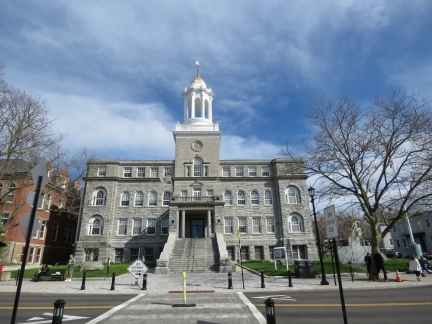 The Newport City Hall building was built in 1900. 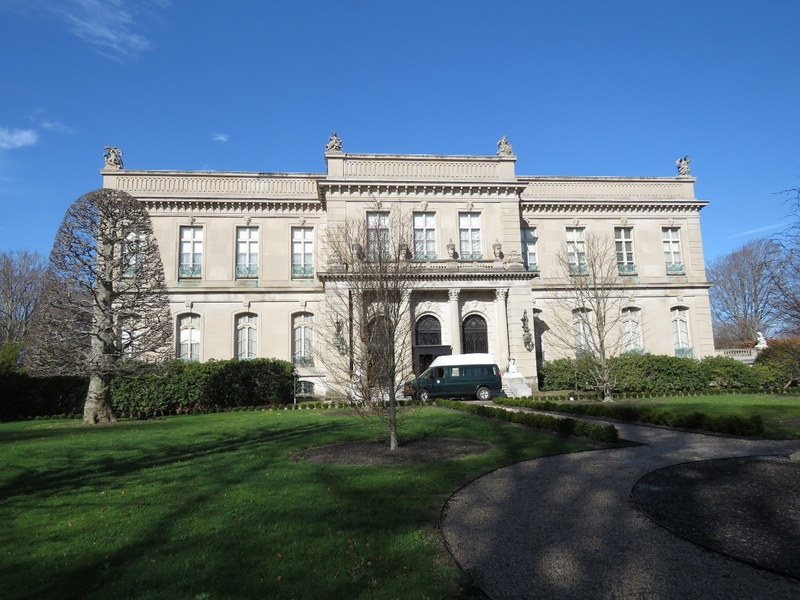 The white cupola is topped with a a gold cap and a weather vane in the shape of a viking ship, symbolizing Newport’s maritime heritage. All that walking around is thirsty business. We enjoyed excellent Rhode Island microbrews at Pour Judgement. 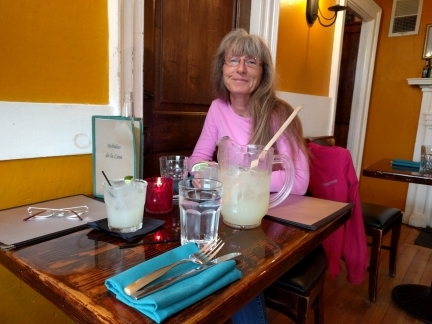 The place was packed—we were lucky to get a table. We occasionally go through our spares and supplies to weed out any extras we no longer need. We discarded a pile of old USB 1.0 cables as we don’t need so many on hand, and also got rid of a few old disk drives. Here James is checking the drive in Jennifer’s old laptop to ensure we can use it as a backup for the nav computer main drive should it fail. The Newport Bridge at dusk viewed from our boat in the Newport Yachting Center. 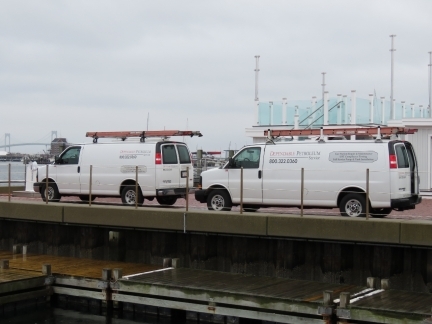 Dependable Petroleum was on site today doing an annual inspection of the Newport Yachting Center’s fuel system. We’ll be buying 2,00 gallons from them just before leaving—glad they passed inspection. 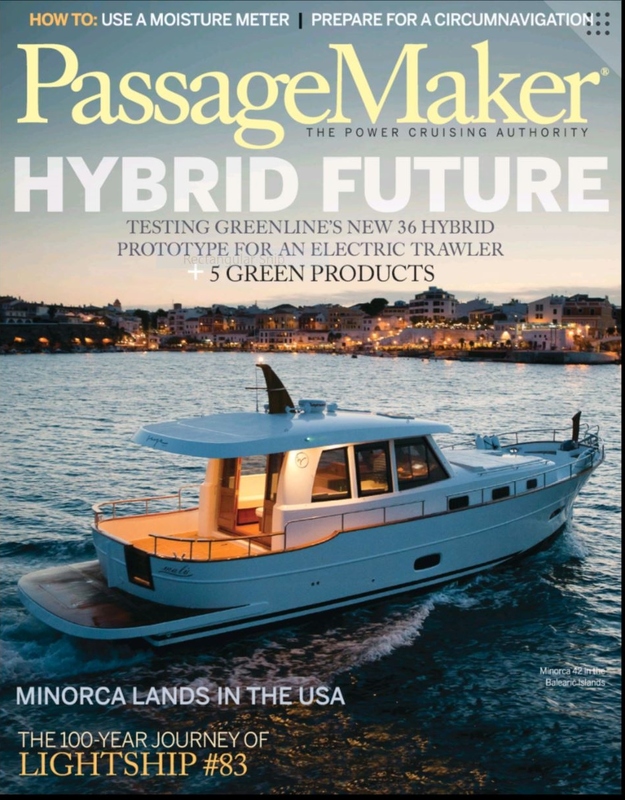 The May/June issue of PassageMaker Magazine is now available, with the second article in our three-part series on cruising the world under power. 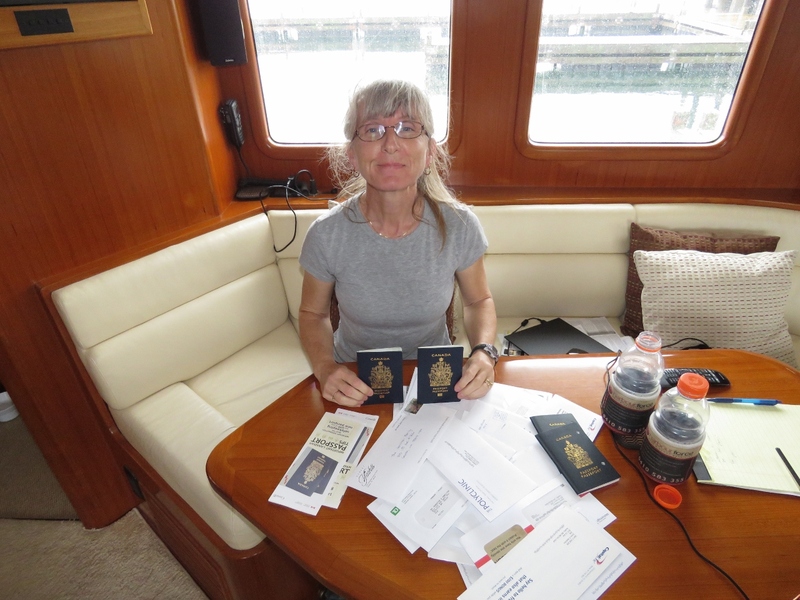 The first article covered planning and various aspects of being underway; this article describes how we made the logistic complexities fade into the background so we could enjoy the trip; and the final installment will cover how we rigged Dirona for the trip. Heavy rains over the past couple of days combined with a high tide that is only 2.5 inches off the max for the year have resulted in flood warnings for coastal Rhode Island. This photo was taken an hour before high tide—the docks have floated up to within inches of the fixed portion of the ramp. An hour later and they were almost touching. James picked up a DHT22 temperature sensor from Amazon and is testing the code that reads it here on a Raspberry Pi. 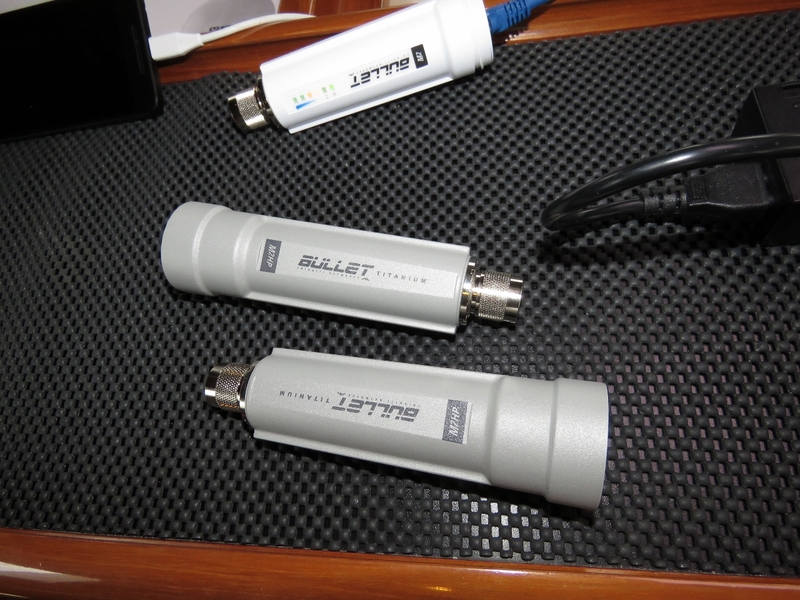 It’s working well and they are under $10 each so we’ll pick up a few more for subsequent boat monitoring projects. Also seen here is a 4-button membrane keypad that is also being read by the Pi. Because the Pi only polls relevant digital I/O pins, we’ll need some way to hold momentary button presses so they can be read reliably by the Pi, which might be busy doing something else when the button is pressed. The weather has been overcast and rainy the past few days and for most of today we could barely see beyond the marina. 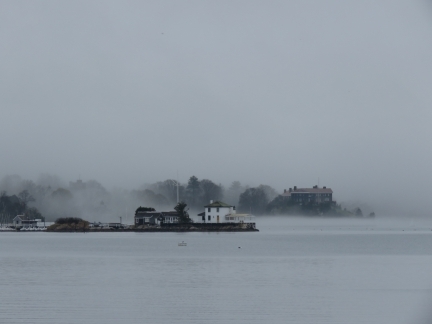 The fog is just starting to lift now. Delicious margaritas and an exceptional meal in a 300-year-old house at our new-favorite Newport restaurant, Perro Salado. 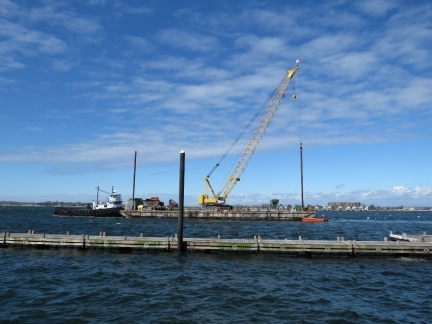 More docks heading out to be installed. 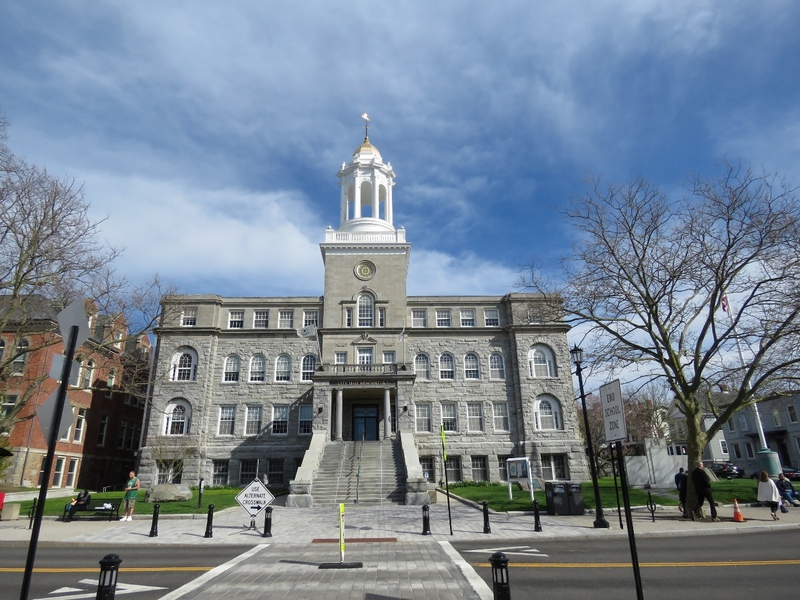 The last few days we’ve seen a lot more activity in the area is the season opening nears. Contractors working on the water system today. We expect to have water available at the dock this week. The power pedestals are coming out too and electricians have been installing them all day. 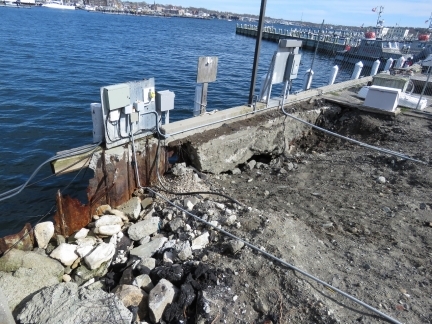 We celebrated the arrival of water, but power is not as big a deal since we have a long cord running up to a shore pedestal. One of the spokes in James’ bike rusted right through. We cut it off, but probably need to replace the wheel, or at least the spoke. 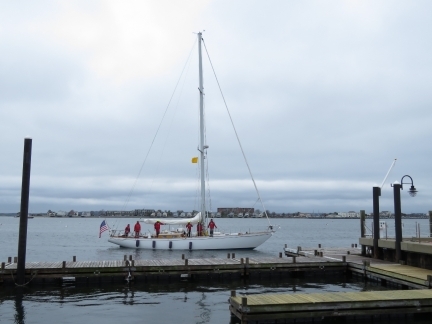 We noticed that Comanche no longer was hauled out and biked over to see if we could watch the mast being installed, but it already was in place. 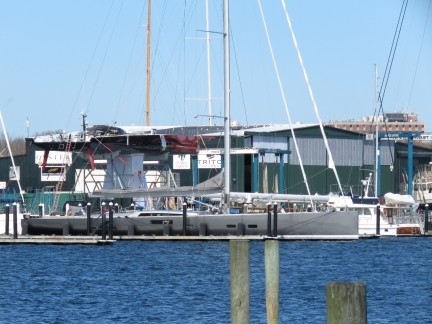 Comanche is so beamy at 25.6ft (7.8m) that she has been nicknamed the “Aircraft Carrier”. That beam is obvious in this aerial shot from the new drone (Comanche is at the far right). We stopped in at Newport Bicycle to see about fixing that broken spoke. The bearings also were shot, so we wanted to replace the wheel. They didn’t have the right size in stock, but could get one in a day or so. Ten Speed Spokes didn’t have the right sized wheel in stock, but could get us one in under two days. And they also had a high-quality used one available. They had us on the road in thirty minutes. The new wheel looks great and we really like Ten Speed Spokes. Lunch at another of Newport’s Irish pubs, Celtica. No Kilkenny, but they did have Smithwick’s, also originally brewed in Kilkenny, Ireland. 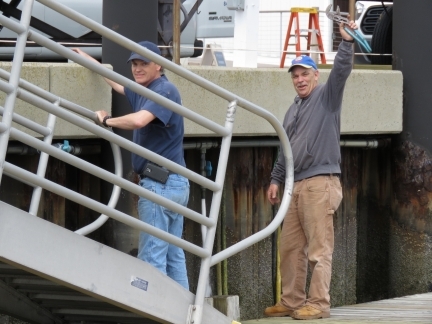 The plumbers signalling that, yes, we now have water on the dock! 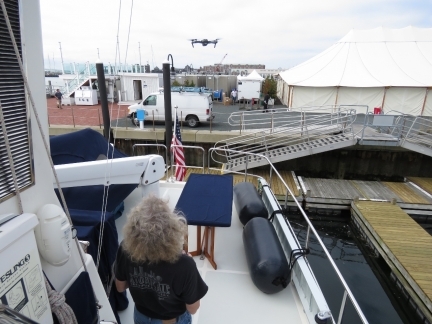 The Mavic Pro is remarkably easy to fly but, as easy as it is, taking off and landing on docks or narrow places feels very tight. 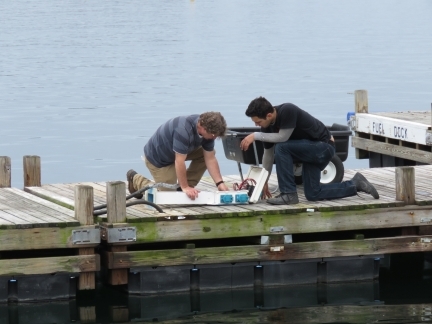 For our intended use case though, we really want be able to fly it off the boat. 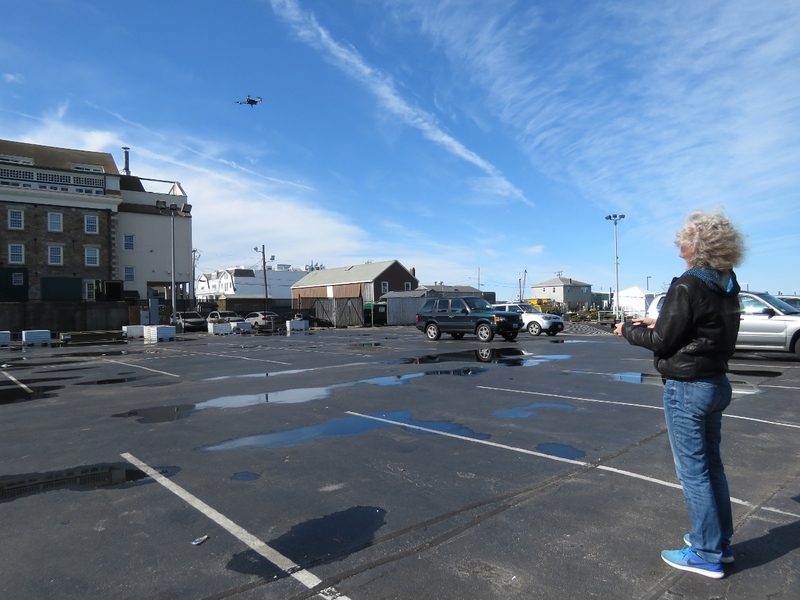 One technique we’ve seen used is to land by snatching the hovering drone out of the air. But the Mavic Pro doesn’t have the large landing pedestal common on many drones, so this approach is less practical. Neither of us want to get our hands that close to high RPM props, so we need to be able to take off and land from Dirona. 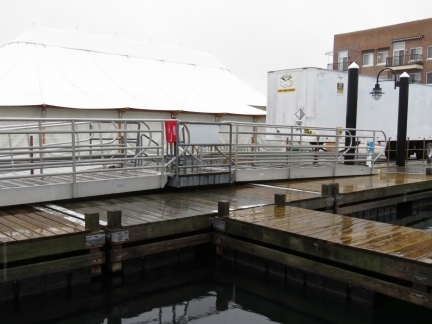 The two candidate locations are the boat deck and the fore deck. The boat deck seems easier and more convenient, so we elected to try it. 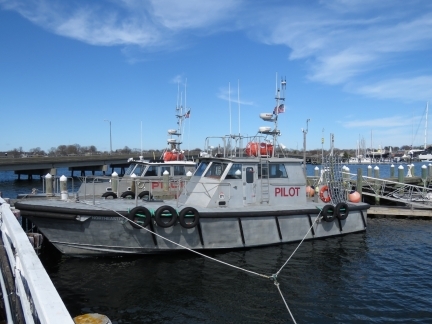 When you look at our boat deck, it seems reasonably big but, when trying to land as a pilot, you quickly learn to respect navy pilots doing carrier landings. There really isn’t much room to work. The video shows how close the drone must be to prop-destroying obstructions in order to land. Just watching the video gives some of the feel for landing with the crane on the right, rails on the left, and Dirona‘s exhaust stack in front. It’s actually not technically that hard, but it sure does feel tight. The footage looking straight down on Dirona nearly alone in Newport Yachting Center shows why it’s worth learning to fly off the deck. 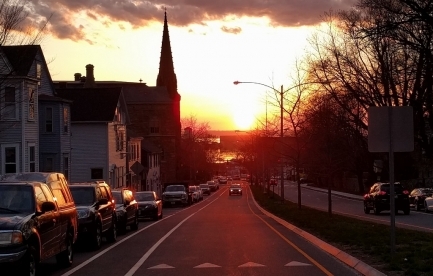 It’s a pretty cool perspective that we typically don’t get. In 1991, baseball manager Tommy Lasorda extolled the virtues of a diet product in a television commercial that ended with Lasorda saying “If I can do it, you can do it”. As we recall, the company ran afoul of false advertising laws and dubbed the commercial to have Lasorda instead say “If I can do it, [maybe] you can do it”, his mouth movements totally out of sync with the words. We’ve parodied it ever since, saying “[Maybe] you can ….” with exaggerated lip movements about some topic or another. 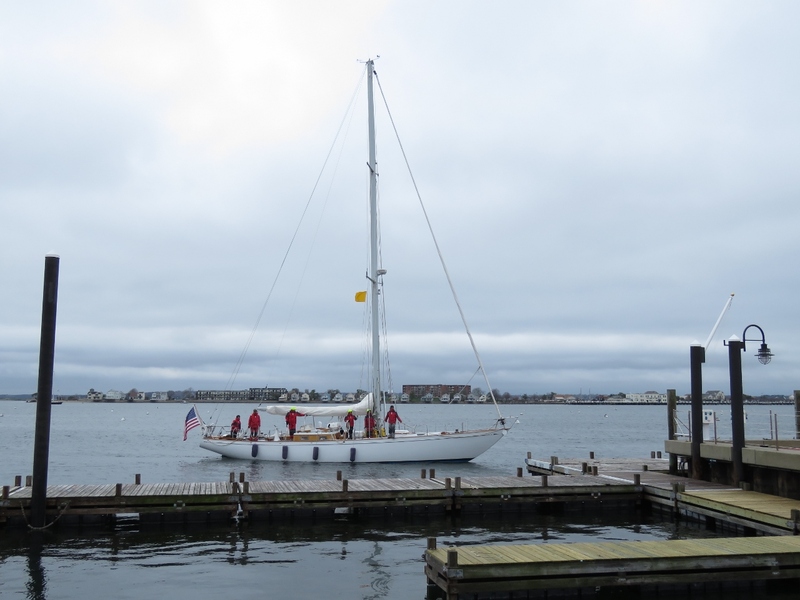 So when Vestas 11th Hour arrived into Newport this morning following a blistering nine-day run across the Atlantic from Portugal, we immediately said, “If a 65-foot racing sailboat with a professional crew can cross the Atlantic now, [maybe] we can do it”. Vestas 11th Hour is formerly Vestas Wind, the yacht that famously grounded on a reef during the 2014-2015 Volvo Ocean Race. 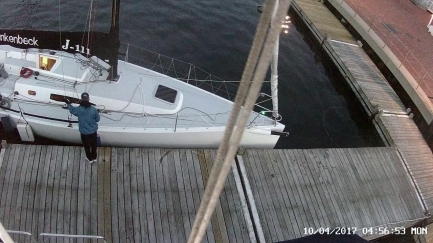 Amazingly, the boat was recovered and transported to Portugal where the team repaired the vessel and in four months returned to the race for leg eight from Lisbon. 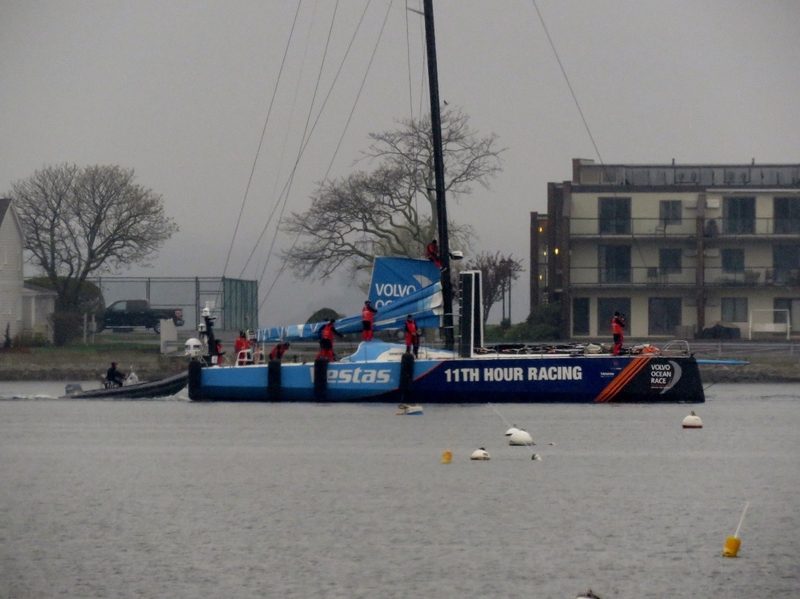 The team will be competing in the 2017-2018 Volvo Ocean Race with new partner 11th Hour Racing. Newport is a host city for the race, and also is the home port for 11th Hour Racing and team co-captain Charlie Enright. We saw this Fort GT outside Dunkin’ Donuts this morning. 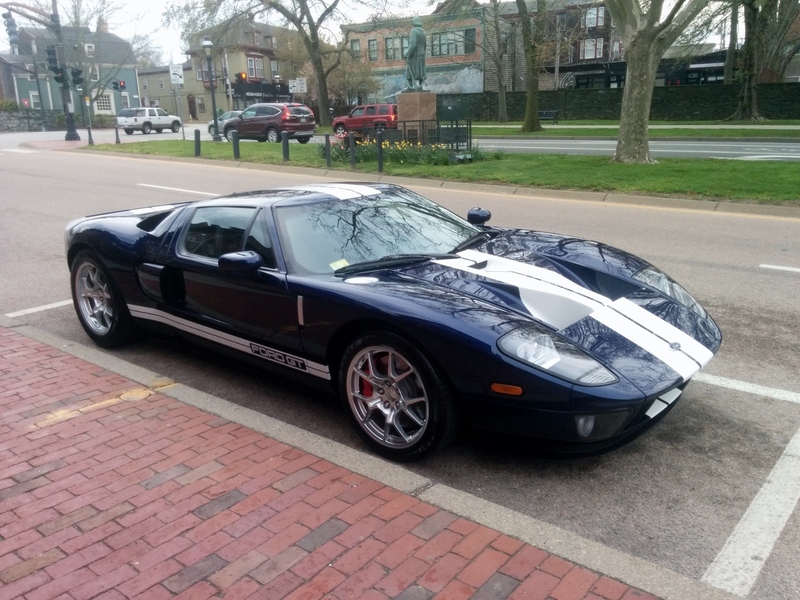 This car strongly reminds James of what was his favorite car for years, the Ford GT40 Mk IV driven to victory at Le Mans in 1969 by Dan Gourney and A.J. Foyt. The tourist season is just starting up this weekend in Newport and Madeleine is the the first harbor cruise we’ve seen since arriving a month ago. 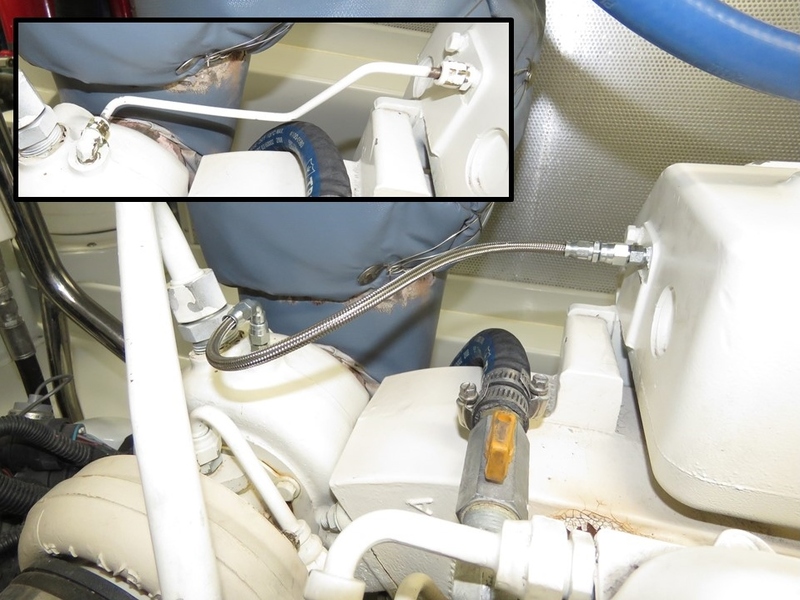 To maximize our outdoor time in chilly climates, we plumbed two outlets from our Olympia diesel boiler under the cockpit table. The plastic louvers had deteriorated over time, so we replaced the vents today. It’s starting to feel really busy in Newport this weekend. 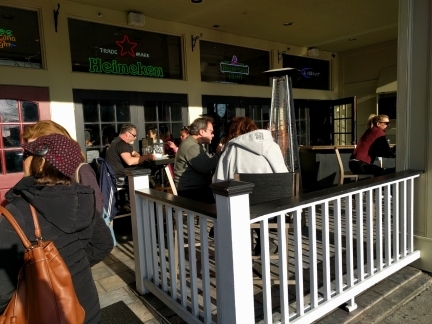 The sidewalks are packed and all the outdoor bars are crowded. 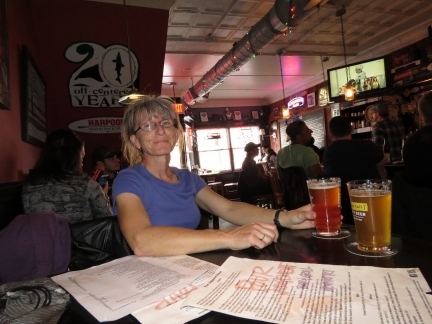 We’d been meaning to check out Malt with it’s excellent on-tap beer list for a while. With all the downtown restaurants crazy busy today felt like a great time to walk a little out of downtown. 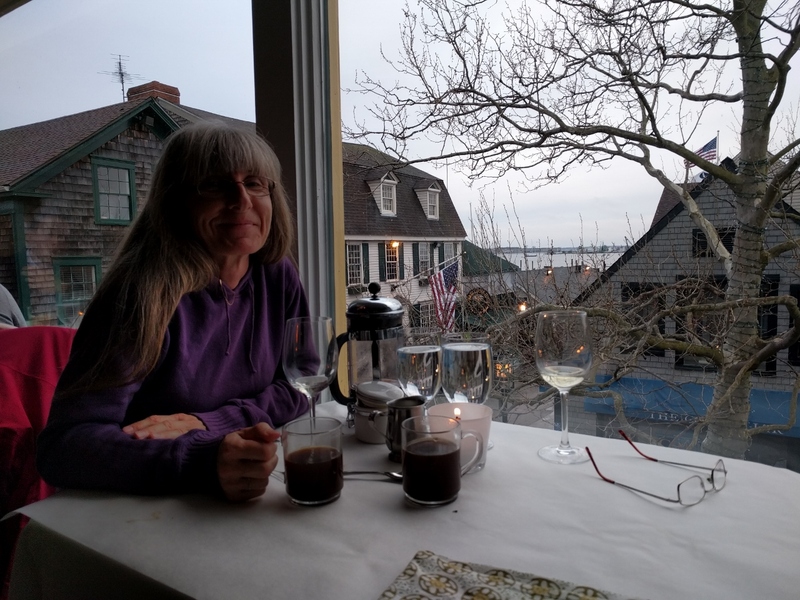 The crowds melted away and we had a great meal in a bay window table. Now that we have water on the dock, we power-washed the boat and filled the water tank. We typically go to the Fastnet Pub for their Sunday night Irish music, and of course, a pint of Kilkenny. The musicians often sing songs about Irish immigrants who live 3,000 miles from home. Hopefully we’ll be seeing the other end of that soon. The staff all wear shirts with an image of Fastnet Rock. We’ll likely be passing within about six miles of it as we near Ireland. 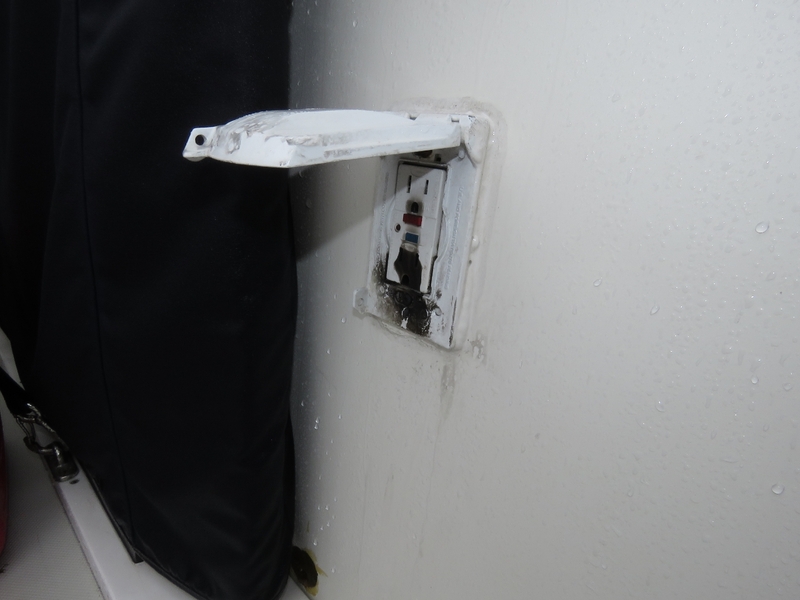 When we first bought the boat, the only way to raise or lower the TV was to hold down a rocker switch on the side of the enclosure. 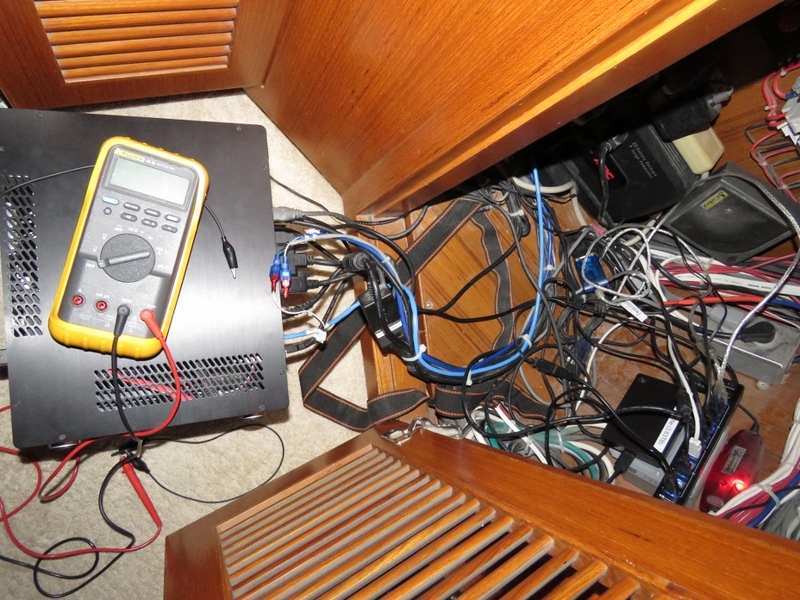 We purchased a remote control adapter from the manufacturer (the yellow box) that adapted to the existing red control box, and also moved the red control box out from under the TV enclosure so we could access it if the TV wouldn’t lift. The remote control never worked well, and when it eventually failed we adapted the rocker switch to the red remote control box, so that at least we could raise and lower the TV with a momentary press of the rocker switch, rather than having to hold it down during the entire lift. We missed having a remote though, so we recently ordered a simple two channel remote from Amazon and wired it in to replace the original remote. It’s ironic that a $15 generic remote has longer range and works better than the original multi-hundred dollar remote supplied by the lift manufacturer. 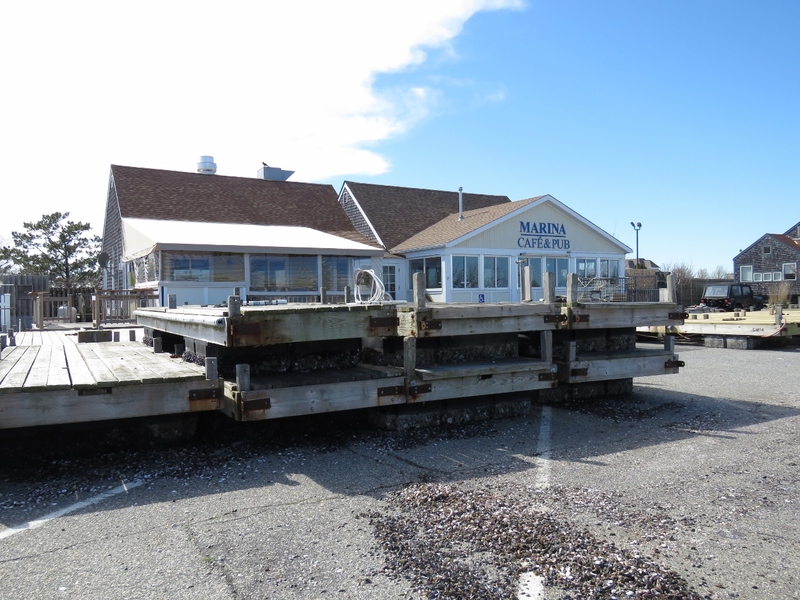 The Landing restaurant had not yet opened for the season when we walked past a few weeks ago. They were open and packed on Saturday, but had plenty of space on this Tuesday night and we had a great seafood meal at a corner table overlooking the harbor. 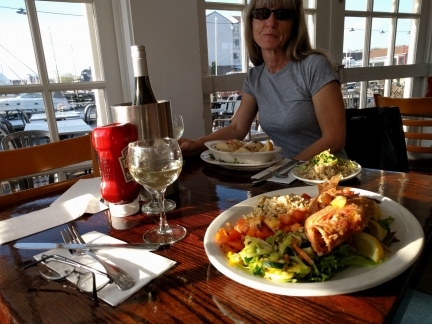 After a day of heavy rain and thick fog, we were surprised to find ourselves sitting in the sun for dinner. A beautiful calm, clear morning after a couple of days of heavy rain and fog. 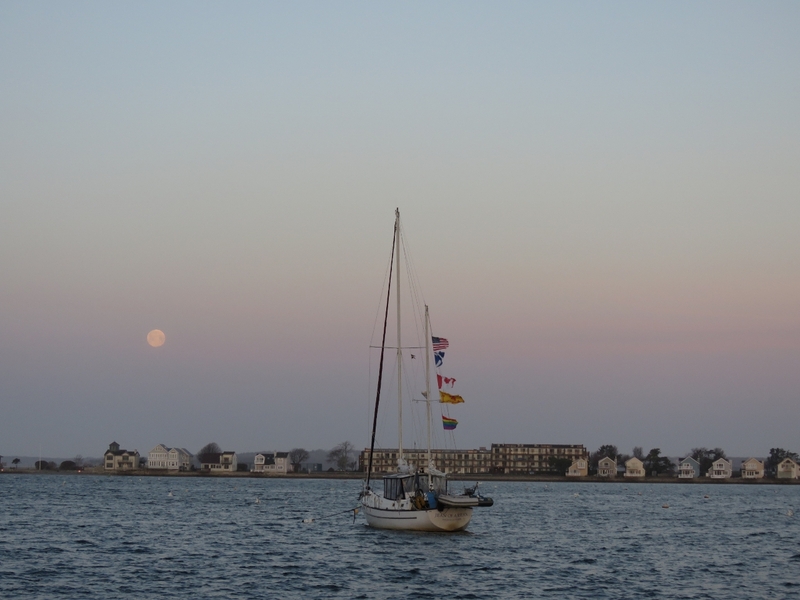 The moorings are starting to fill in a bit. 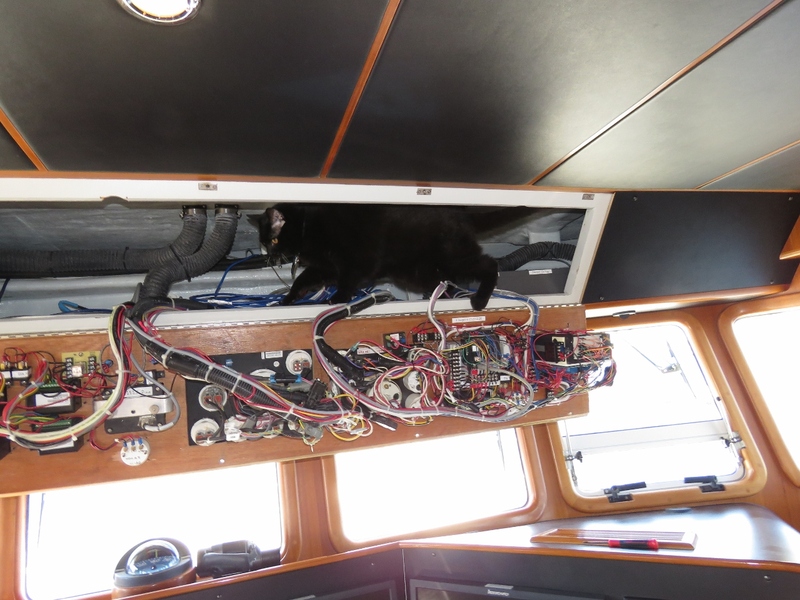 Spitfire continues to investigate every open panel or locker in the boat. He hasn’t knocked any wires off up there yet, but we’re certain that will happen eventually. We were investigating how to reliably read momentary contact switches from a Raspberry Pi. We use this for the Watch Commander. It’s super easy to read external switches but the problem with momentary contact switches is the actual keystroke might only be 100msec (1/10th of a second). If the Pi is doing something else and doesn’t look for even a 1/4 second, the button press may be missed. Our first approach was to use a latching relay where the relay is closed by the switch, then the power through the relay is fed back through a timer to keep the relay closed so there is ample time to read it. Then later the time expires and the relay re-opens. This works well but surprisingly, a mechanical relay ends up missing some short key strokes. We then changed to a semiconductor relay which is faster, but still misses the odd key stroke. It turns out a much simpler and more reliable solution is have a separate process on the Pi polling the switch state. This takes a small amount of CPU but is absolutely bullet proof and is far simpler electrically. 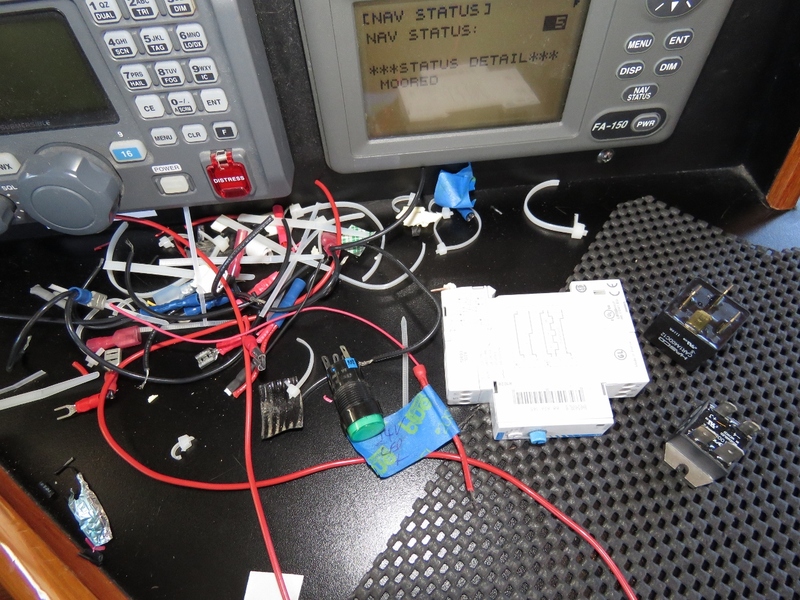 This is the debris from removing the relay and timer-based solution and moving to software polling in a separate process. Our last Amazon Prime delivery for a long time. Erica Buchanan, who is from Seattle but now lives in Newport, brought over a batch of homemade biscotti for our trip. Yum! 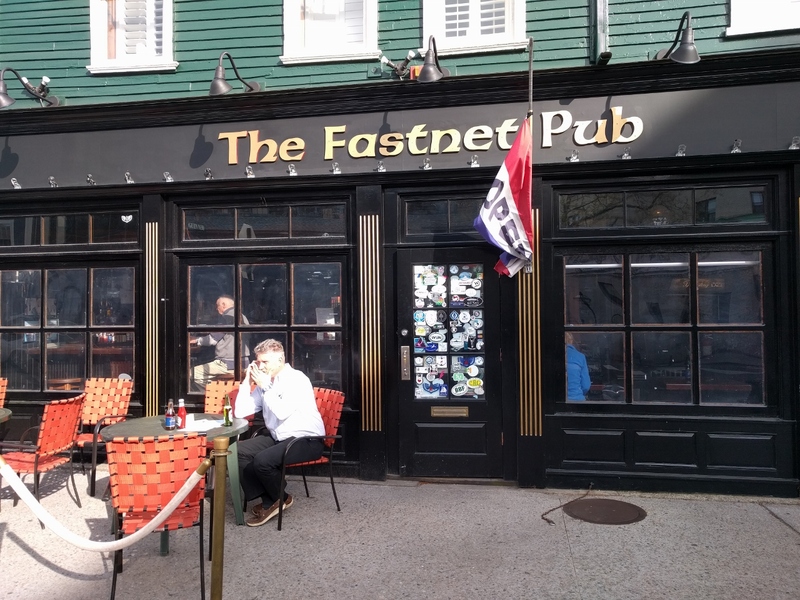 A final stop at the Fastnet Pub before we embark on our Fastnet-to-Fastnet run. 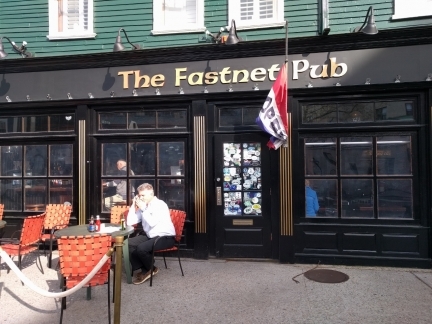 We’ll be passing within six miles of Fastnet Rock, the pub’s namesake, as we near Ireland.